If you are like many kids and just want to see the pictures, go to the picture page. 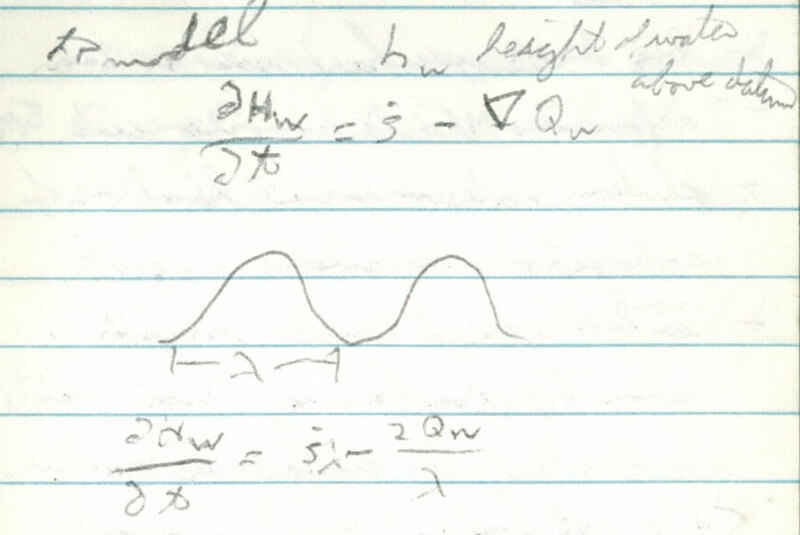 The text below is essentially just my notes from the field trip. I have reformulated the notes into complete sentences, but have not attempted to put them into a guidebook-like narration. Driving directions are in bold. Stops are in bold italic. GPS waypoints are given with the latitude first, in decimal degrees north of the equator, and the longitude second, in decimal degrees east of the prime meridian (so -120 means 120 degrees west). A text file with all the GPS points from this trip and our second trip can be found here. Picture thumbnails link to larger versions of the same picture. 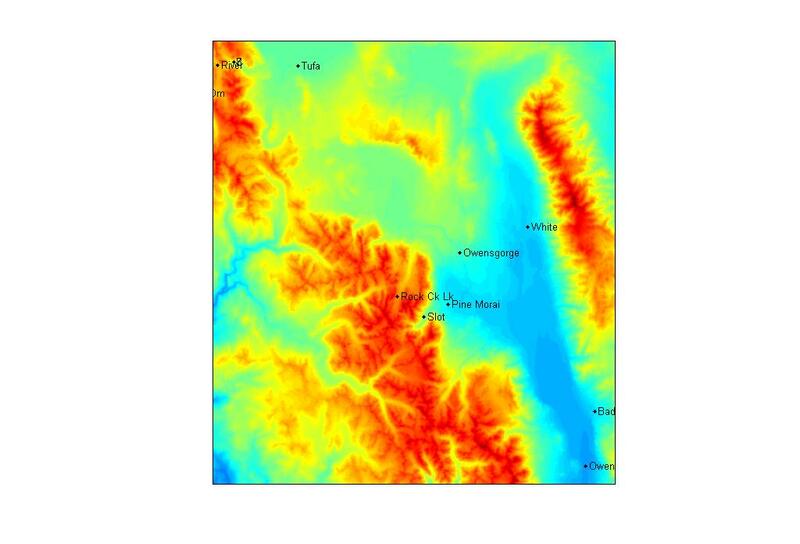 A Digital Elevation Model of Southern California, including the area of this trip can be found here. More detailed sections of the DEM are included below. The underlying data is available from a number of different sources. I downloaded it from here. Drive back to Highway 120 and take it east to Yosemite National Park. Turn left at Crane Flat to get onto the Tioga Pass Road (still highway 120). Stop at milepost T14.GPS: 37.83936929, -119.5902736. Notice that there has not been much local relief on the drive from Don Pedro. Despite the fact that we have climbed to over 8000 feet above sea level from Don Pedro at 1500, there has been only about 1500 feet of local relief (on the watershed scale) the whole way. 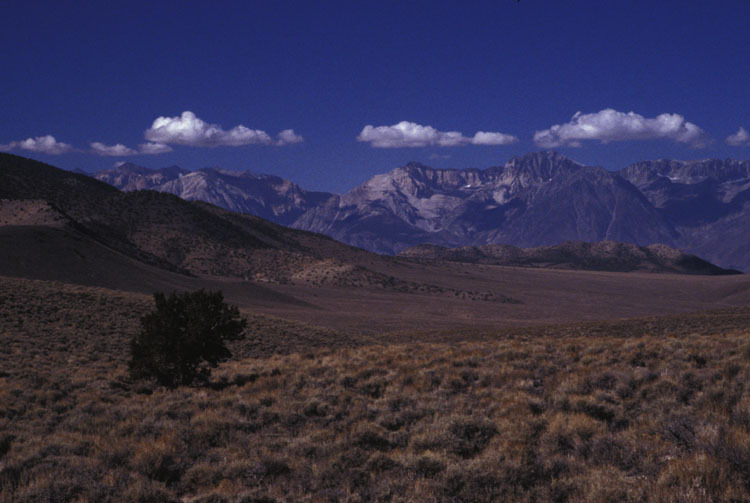 The broad conception of the Sierra Nevada range is that of a tectonically tilted block. The Basin and Range (east of the Sierra) are up at an average elevation of about 6000 feet while the Central Valley is just a bit above sea level. Faulting along the east side of the Sierra allows the Sierran block to move vertically relative to the rest of the continent. The Central Valley is slowly being filled in by sediment that has been eroded off the Sierras. The isostatic response to this extra loading of the crust acts to increase the relief of the mountain range. The Central Valley is about 100-150 km wide, while the response length to crustal loading of this sort is on the order of a couple hundred kilometers. CR is Coast Range. CV is Central Valley. SN is Sierra Nevada. The broad ramp of the Sierran block is punctuated by a few major rivers. 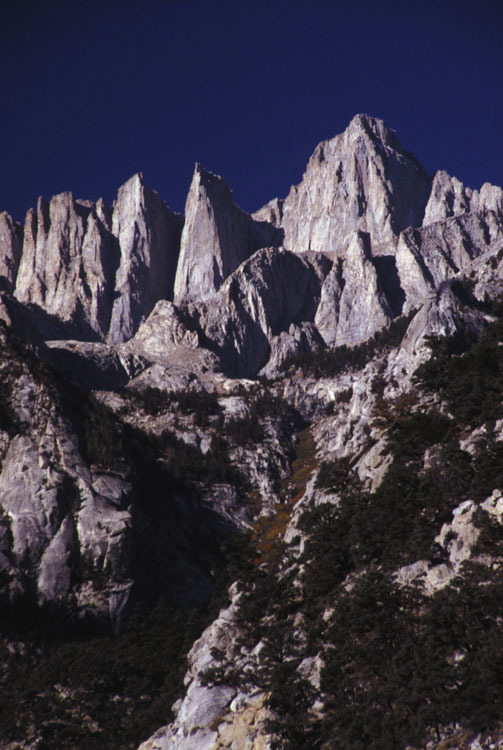 Kings Canyon is inset into the western side of the range by about 10,000 feet. More typically, the major rivers are inset by 3000-4000 feet vertically. The Yosemite Creek valley that we see in front of us is a tributary to the Merced River. Conceptually, larger rivers will generate larger incisions, providing the local base level for smaller rivers. These landscapes are “young” in a Davisian sense. This is a simple tectonic environment and the bedrock is relatively homogeneous. There is a smaller glacial signal recorded in the landscape to the south. Here it is quite strong. Why is Yosemite Valley so deep? It has a large catchment area and has a strong rock mass that can support tall cliffs. 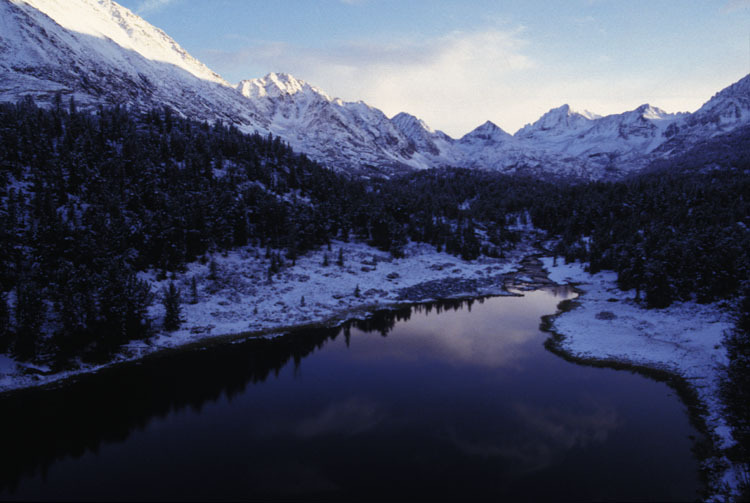 What is the relative importance of glacial versus river erosion? There are a number of things we have to consider to make a stab at this question. 1) The ice occupied the valley for a shorter time than rivers. 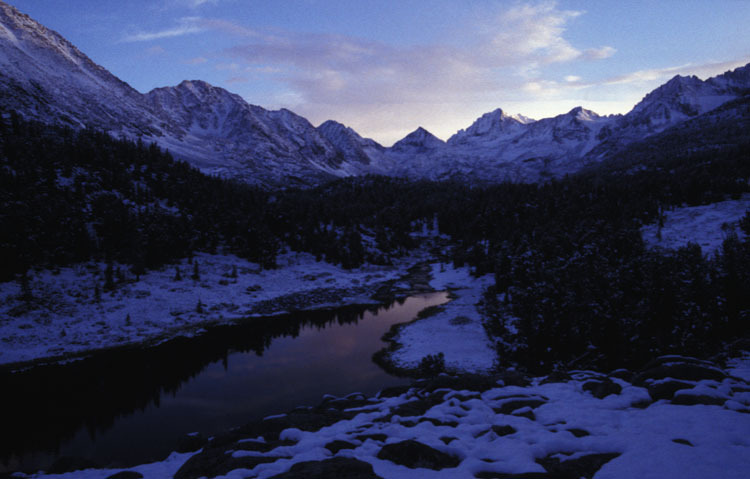 2) The Sierra have re-uplifted in the last 5 million years. 3) This type of mountain range has been in existence here for the last 100 million years (the timescale of subduction under North America). 4) The ice ages lasted about 2.5 million years. 5) Ice occupied Yosemite Valley for only about 20,000 years per glaciation, for a total of a few hundred thousand years. Yosemite Valley definitely has a glacial form. There have been big drainages here for the last 10 million years. Deformation east of here has been more recent (5 Ma). Plutons are magma chambers of subduction volcanoes. The roof pendant of the magma chamber was eroded by the magma and incorporated into the magma. There is a chance that some of the topography that can be seen from here may be a remnant of (or at least be controlled by) the shape of the surface of the pluton. Drive a bit further east on Tioga Pass Road and stop in a turnout on the south side of Yosemite Creek 37.85186402, -119.5750026. When Yosemite Creek flows into Yosemite Valley it forms the 3rd highest waterfall in the world. (Or the seventh highest if you only include the free fall of the Upper Yosemite Falls). Yosemite Creek is dry at this time of year because of the highly seasonal climate and the low storage capacity of the granite. The water table within the hillslopes next to the river provides the base flow to the river. But in this case, the water table is quickly depleted after the spring snowmelt because of the granite’s low capacity. 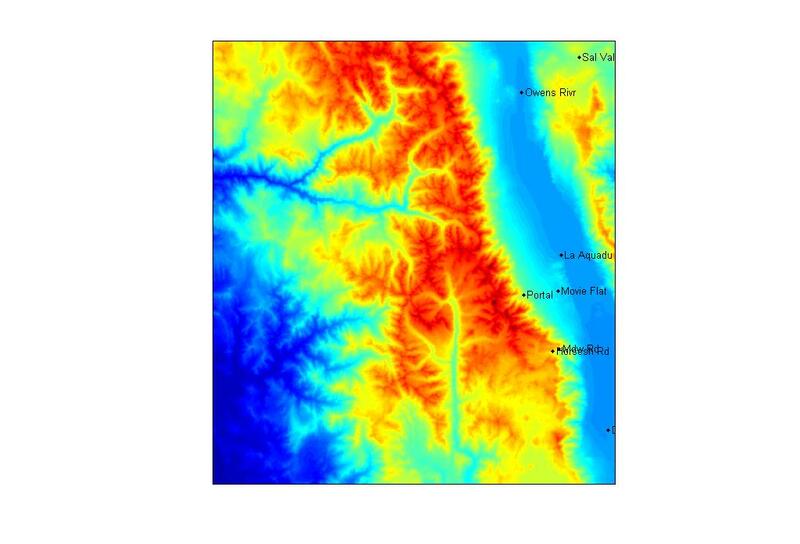 In the figure below, the solid line is a cross-sectional profile of a river valley and the dotted lines represent the water table at different times of year or in different climates. 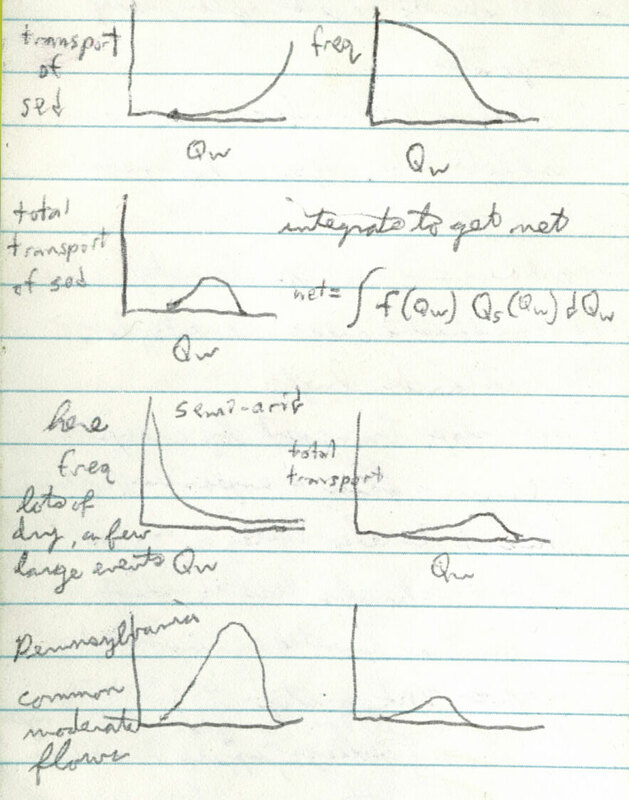 To model the drop in water table over time, one would set up a differential equation like the first one below, where Hw is the height of the water above some datum, s is a source term, and Qw is the water flux. 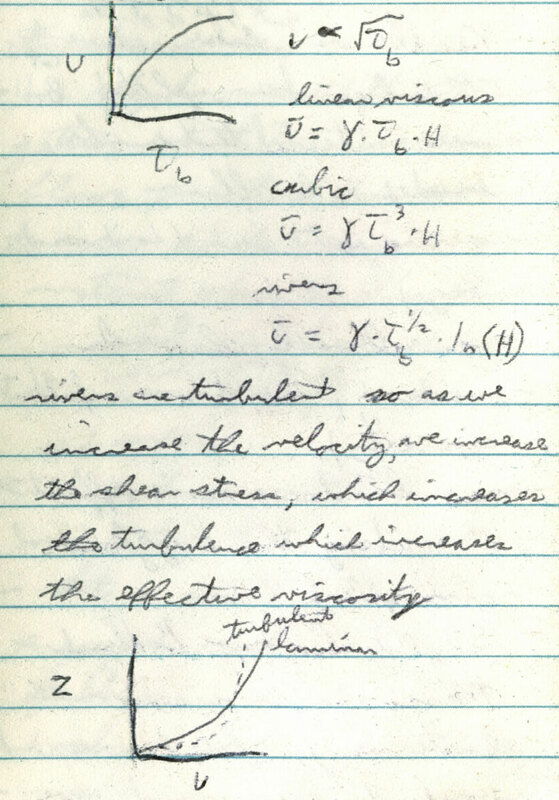 Considering the whole hill, one could add a characteristic wavelength term to the equation as in the second equation below. These equations are linear differential equations for Hw which give an exponential decay solution for the height over time. 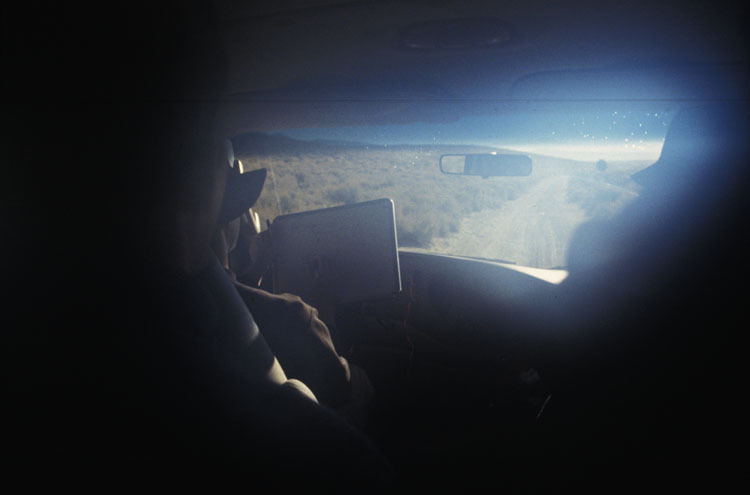 Continue driving east on Tioga Road. Stop at Olmstead Point 37.8104881, -119.4861818. Tenaya Creek is more deeply incised than Yosemite Creek. Why? The ice discharge from the Tuolumne came this way. It could also be explained by a zone of weakness in the bedrock (i.e. a fault). A number of exfoliation features can be seen from this point. These near surface features show up in granite more than in other rock types because the other rock types usually have many preexisting weaknesses that fail before the exfoliation process can act. We would expect fast unloading of the overlying roof rock to produce thinner exfoliation layers because at slower rates of unloading there are other ways to release the tensional stresses besides making exfoliation cracks. This area does not have much regolith. It is therefore termed “production limited.” Biological activity is probably important for regolith production. The hot, dry summers and the bedrock type are also important. It’s possible that the Sierra could pass a threshold after which it will develop regolith quickly. The vegetation seems to get started in pockets of glaciofluvial sediment or on talus slopes. If the climate is right, the vegetation will eventually take over. There is some glacial polish left on the rocks beneath our feet. Where the polish has been broken, the surface weathers faster and small pits develop in the rocks. The dark black streaks are caused by some sort of weathering reaction that is biologically mediated. Continue driving east on the Tioga Pass Road. Stop at Pothole Dome 37.88060113, -119.393639. General points: how do we think about landscape in a geographical sense? How is relief generated? On a large scale it is generated by tectonics and locally by erosion. The uplift of the basin and range was (and is) associated with a cessation of subduction. When subduction of the Pacific Plate underneath the North American plate stopped (no more cold oceanic lithosphere being transported under the continent) the continent had no choice but to warm. The warming caused topographic uplift. The uplift in turn created a pressure gradient (higher pressure under the uplifted block, lower pressure under the relatively stable blocks on either side) and this pressure gradient produced an extensional stress. The extensional stress produced extension (a relaxation of the topography). The cessation of frictional drag between the two plates may also have contributed to the relaxation. Once extension starts, a feedback can get going because extension (thinning) causes heating which leads to increased uplift which increases the pressure gradient which causes more extension. The motion of Oregon is a rotation relative to North America. Some compressional features in Washington and Oregon absorb this rotation. The history of tectonism is important for the landscape. Tectonism and sedimentation affect the geology (lithology and structure) and hence the landscape’s susceptibility to erosion. 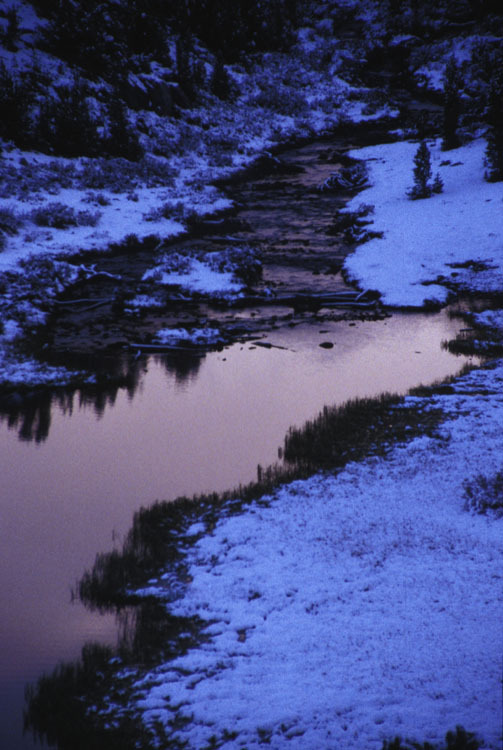 What is the hydrology of a river? Discharge (what time scale?). The mean discharge is controlled by basin area and precipitation. The seasonality of the discharge depends on the seasonal climate (of precipitation and snowmelt) as well as the path that water takes to get to the channel. How is runoff generated here? We’d expect to have Horton overland flow, shallow subsurface flow on the forested slopes, and saturation overland flow in the meadows. Next general question: Look at the hill slopes. Are they production or transport limited? Weathering produces regolith. How is material transported down the slopes? Here we have gravity transport, mostly for larger blocks. A bit of chemical weathering. Sheet wash of gruss. A few small channels. But in general erosion has been slow (we still see polish in places, and there is not much in the way of deposits on the landscape). General question: How is sediment transported in the rivers? Both the mean magnitude and how it varies over time are interesting. Zones of deposition versus zones of erosion. Bedrock versus alluvial channels. Suspended versus bedload transport (suspended load is usually more important volumetrically). Sediment transport is generally a non-linear process so large flows are very important. A simple model of erosion can be set up as: the partial derivative of Hs with respect to time = a source term – the divergence of the sediment flux. The current zones of deposition and erosion on this landscape are related to the different longitudinal profile created by glaciers (relative to that created by rivers). General: What about aeolian transport, glacial processes, periglacial processes, coastal processes? Here we have roche moutinees (i.e. Lambert Dome, Pothole Dome, and there are some small ones amongst the trees in the middleground of this picture) which are characteristic of glacial erosion. The smoothed topography and the lack of regolith here are also characteristic of glacially eroded landscapes. 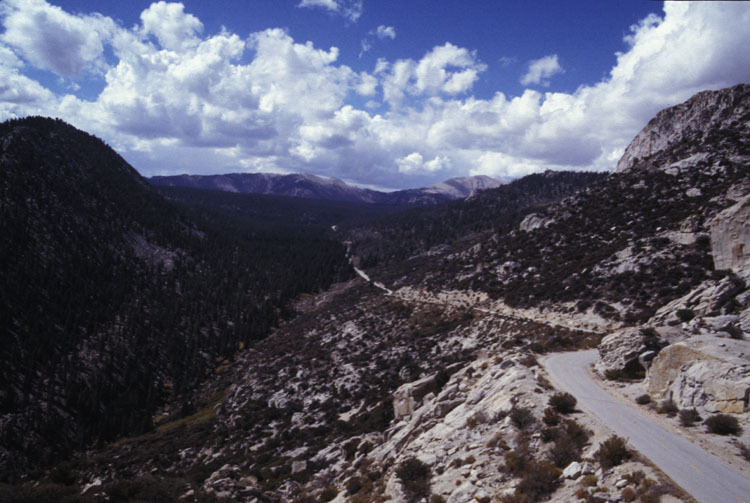 Drive farther east on Tioga Pass Road. Stop at milepost T33, 37.88025789, -119.3276493.The road here was cut into a moraine. The largest clasts in the moraine are 1.5-2 m long. These large clasts are in a matrix of smaller material with a lot of silt. The channel below the road has some huge clasts in it despite the small flow. It is transporting the small stuff out from under the boulders. Some of the boulders are fluted (telling us that they have been stable for a while). On the far mountains we can see some perennial snow patches on north-facing slopes. Drive over Tioga Pass, making sure to stop for a chat with the ranger in the box at the entrance station, and turn left onto Saddlebag Lake Road. Stop at the GPS coordinates 37.9430365, -119.255681. Lee Vining Creek has an alluvial bed for most of this section. There is a lot of vegetation (willows and some other plants) close to the stable, low banks. No evidence of high flow but we do expect higher flows during snow melt. There are some vegetated bars in the channel. The channel is fairly straight. Bed material is pebbles and cobbles. But the banks and beyond are composed of gruss. There is a dam upstream that may allow the fines to settle out now, partly explaining the lack of fines in the bed. But farther upstream is a natural lake which would also tend to filter out the fines. 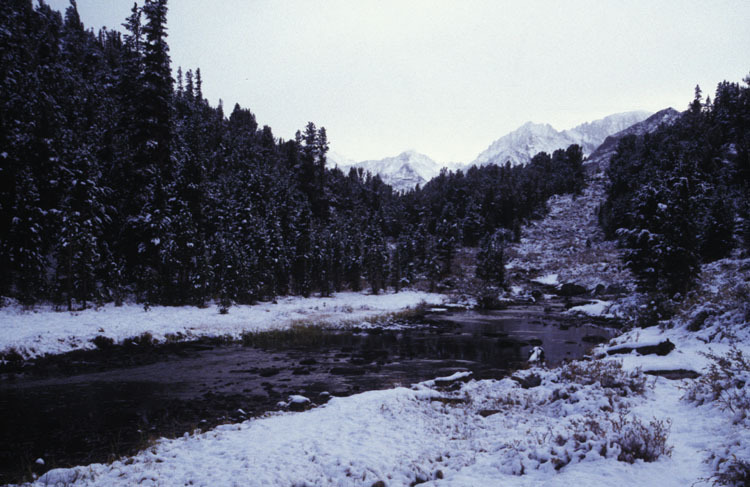 The Conness Glacier is one of the sources of the fine material and it is providing some of the mean summer flow that gets passed through the dam. The roughness of the channel depends on: the bed, bends in the channel, pools, riffles, and bars. Width depends on bank strength (which depends on: bedrock vs. sediment, vegetation, sediment cohesion…). With clays and silts in the bank, a narrow channel with tall sides can be supported and is common. With other types of sediment in the banks, the channel tends to be wider and shallower. Return to Tioga Pass Road (120) and continue east down Lee Vining Canyon. Stop at a convenient turnout 37.95013899, -119.210494 . There is a lot of relief here and a lot of downslope transport. 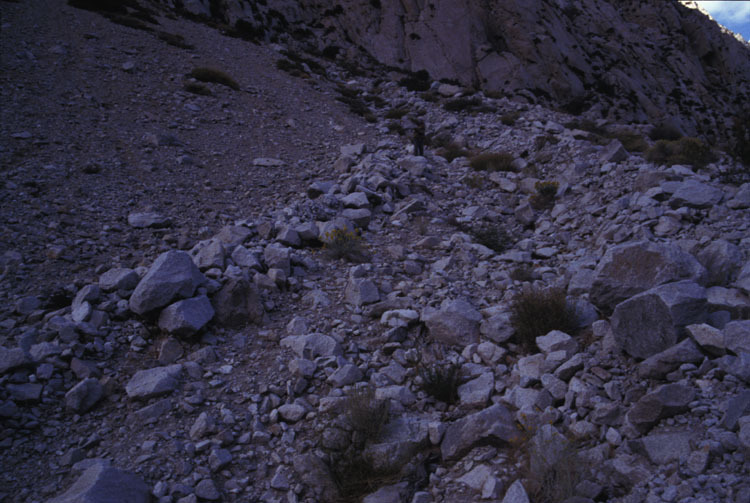 Fans abound, debris flow channels are obvious and talus slopes are also common. There is a rock glacier on the slope above the canyon. 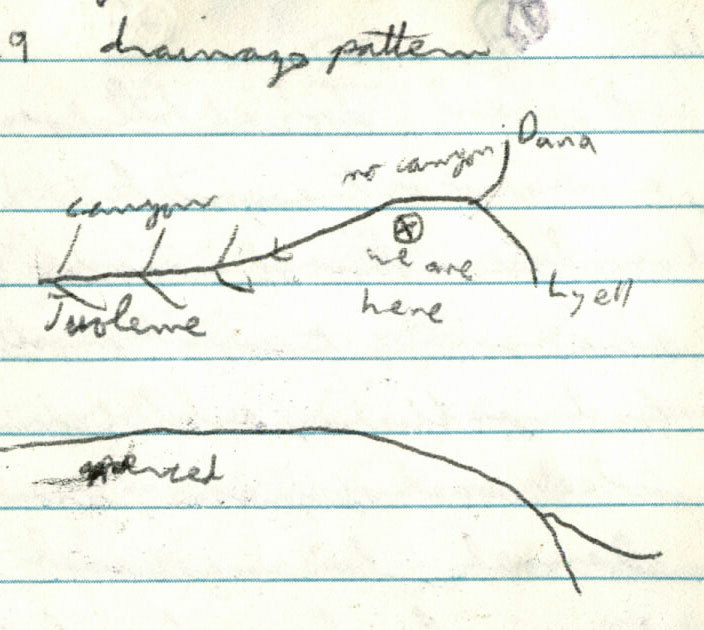 We also note the step in the longitudinal profile, the last stop was above the step, and below the step we have this canyon with a relatively steep channel. Drive east on 120 to Highway 395. Take 395 south past Lake Crowley to Rock Creek Road. Take the Rock Creek Road to the end. Park and walk up the trail to Box Lake 37.42762724, -118.7511106. 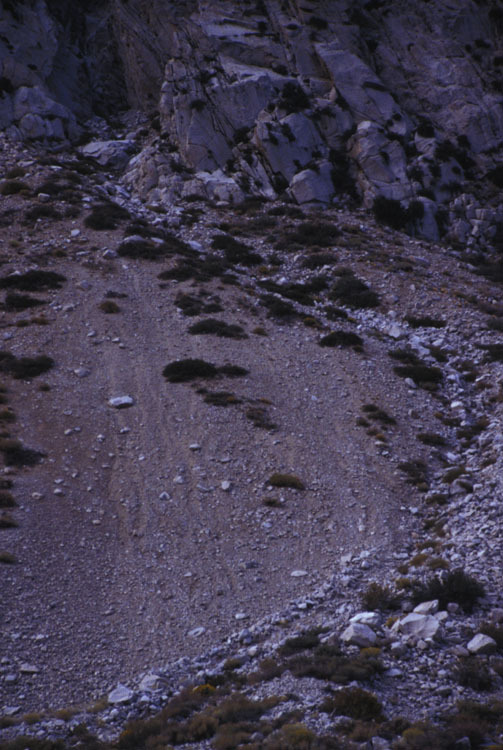 Rock Creek has a much gentler slope than Lee Vining. This valley is in a step-over of the east side normal fault. Features we can see from here: lakes, cirques, arête ridges, rock glaciers, moraines (on the drive up). We can tell the rock glaciers are advancing by the fact that their fronts are steep, almost at the angle of repose. Jointing has created more jagged walls here than in Lee Vining Canyon. Benches on the valley walls show the previous extent of glaciers. There are no benches above a certain level up the slope. The reason that the joints are more exposed may be because of the rate of glacial erosion. 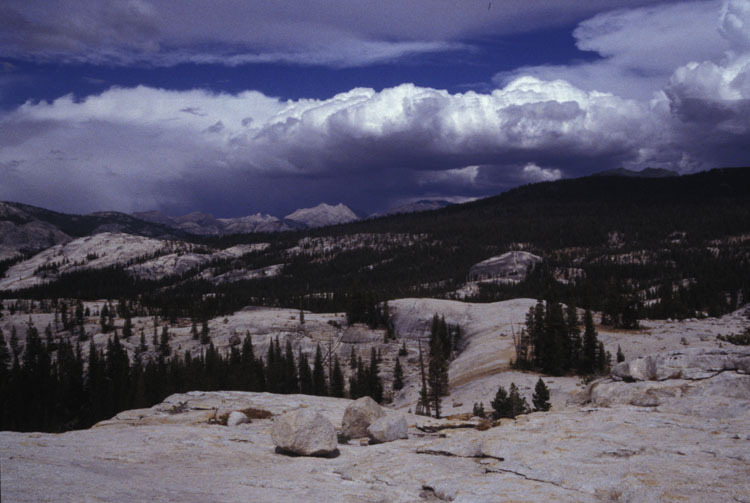 The Desolation Wilderness has smoother polished surfaces – that is probably because the glaciers eroded down below the interglacial fractures. The lake we can see here is probably filling in slowly (not much sediment gets passed through). Slowly because the glaciers took out most of the material. The lake has shallow banks. Creep and small scale rockfalls along with debris flows are the dominant downslope transport mechanisms. The light was nice so I took a lot of pictures. Drive back to 395 and go south. Take the Owens River Road towards Hot Creek Geyser. Stay on Owens River Road past Antelope Springs Road. Take the next left onto a dirt road and drive past the hot springs to a camping area. Drive back to Hot Creek Geyser . 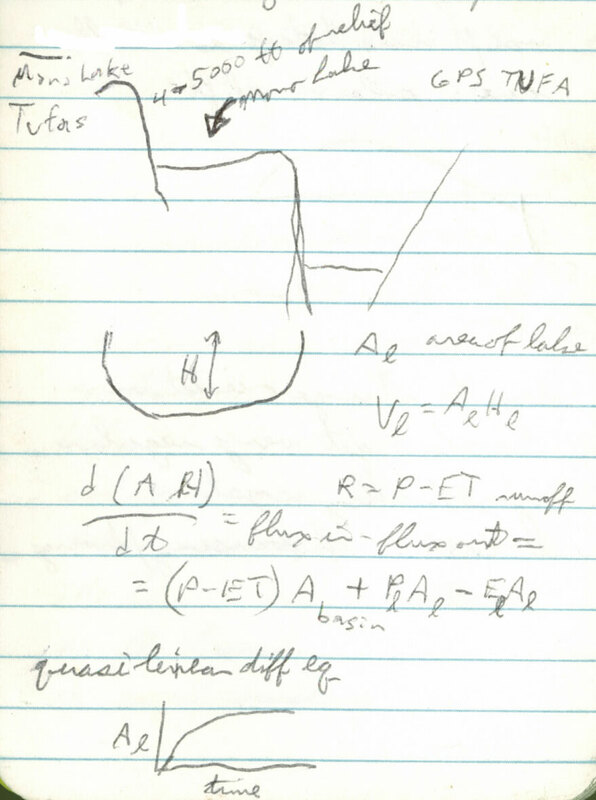 We found that Kurt is remarkably good at driving on dirt roads while writing equations on a whiteboard. It was so early in the morning after a cold night that even my camera had not had a chance to wake up yet (the fog was on my lens not the windshield). When the volcano that formed Long Valley caldera erupted, it spewed hot ash as far as the Midwest. Hot toxic gases spilled over the Sierra and killed vegetation in the Central Valley. 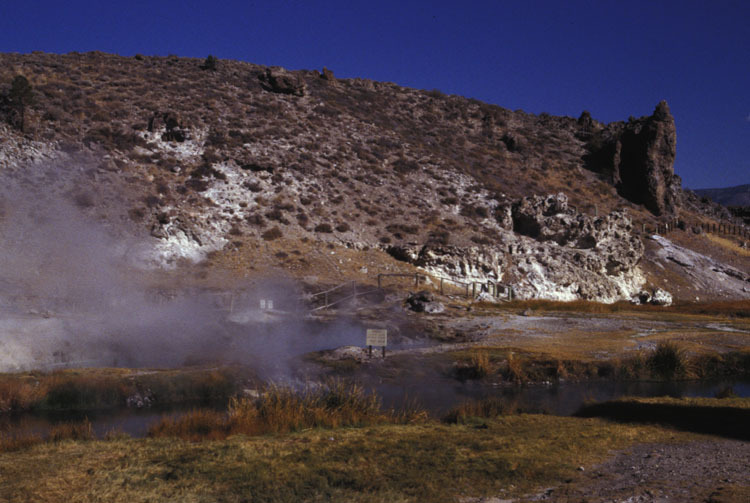 Groundwater circulation creates hot springs in fracture zones. Here we have a 10 km thick crust or so. Continental crust is usually 30 km thick. There is a high geothermal gradient here because of the thin crust and the fractures. Rhyolitic volcano - silica-rich magma with the consistency of ice. Other calderas in the US are near Los Alamos, and the Yellowstone Plateau. Yellowstone Lake is in the center of the Yellowstone caldera. The terms crust and lithosphere describe overlapping portions of the earth's interior. There is a chemical layering of the earth (the crust is the outermost layer) and a mechanical layering of the earth (the lithosphere is the outer, rigid shell of the earth). Resurgent dome - a few magnitude 6 earthquakes in the 1980's and late 90's produced and 10 cm/year of inflation at the Long Valley resurgent dome. During this period of activity magma got within 1 km of the surface. Mammoth Scenic Drive was created as a second escape route for the area and named a scenic drive, despite the lack of spectacular scenery, so as not to scare people. There is a whole line of volcanic cones to the north of here that have formed since the main Long Valley caldera eruption 700,000 years ago. Harmonic tremors continue into the present and CO2 emissions have increased recently in the area to the west of Mammoth. This hasn’t stopped plans for more development in the area though. Drive south on 395 for a few miles. 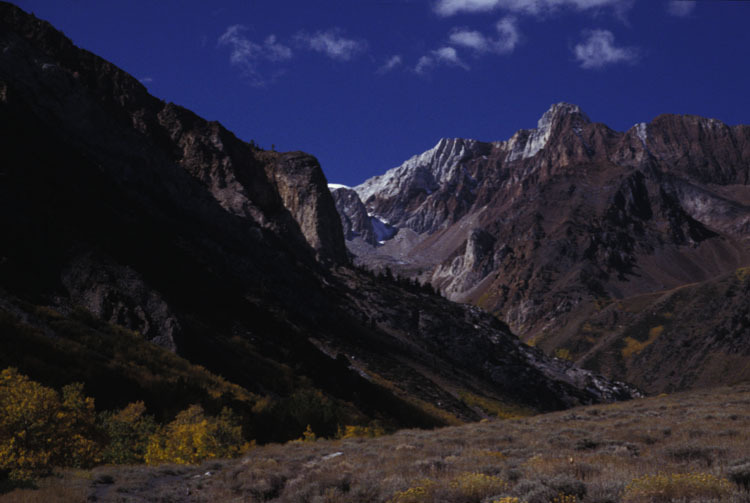 Note the beautiful moraines from glaciers that came out of the eastern Sierra during the last ice age. Turn off 395 at the McGee Creek Road. Stop inside of the moraine complex. Nice lateral moraines are preserved here (seen on the left side of the first picture above, continuing into the distance). The second picture is from farther up the valley. The lateral moraines grade into terminal moraines at the end of the valley (behind me in the pictures) but the terminal moraines have been washed out to some degree by McGee Creek. Grain sizes in the moraines are up to 3 m. The moraines have a complex pattern due to numerous advances and retreats of the ice. Up valley just a little ways the Hilton Creek fault scarp is well-exposed. Drive back to 395 and go south a few miles. Exit and follow dirt roads to the Owens River Gorge 37.52539996, -118.57475. 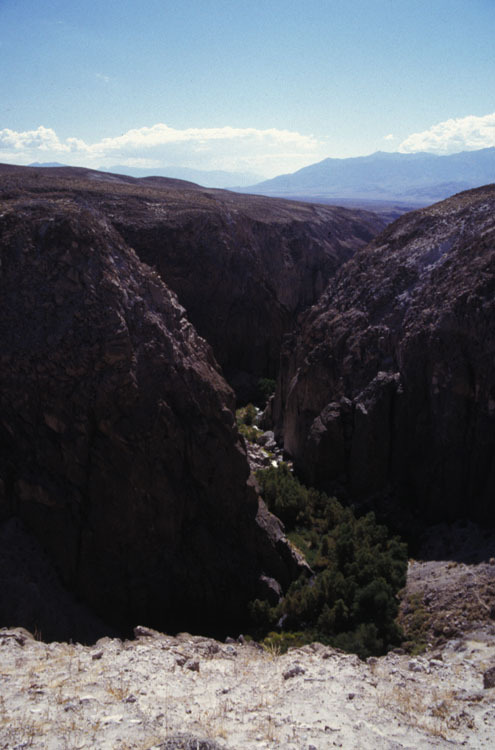 All the water from the Owens River was diverted out of the river for the Los Angeles aqueduct from about 1940 until 1991 when they started allowing some flow to come through this section of the canyon (LA recaptures the water farther downstream). Since 1991 the river has been managed so that the base flows are about 50 cubic feet per second (cfs). In spring they send down a pulse of about 100 cfs to redistribute sediment. The pulse trails off, back down to the base flow, over a period of about 10 days to allow the cottonwoods to root. The total flow today is quite a bit lower than the natural flow. Willows reestablished themselves first after water was reintroduced to the river in 1991. Now the cottonwoods are looking pretty good. Tamarisk invasion is a problem elsewhere but not here (yet). The gorge allows us to see how much erosion has occurred since the Bishop Tuff was emplaced about 700,000 years ago. The gorge is about 100 m deep. That figure yields an erosion rate of .14 mm/year, which is reasonable. The hillslopes will eventually overwhelm the river’s transport capacity and incision into bedrock will stop. What’s important for incision (in a general sense)? Discharge, sediment cover of the bed, rock strength, slope, tools (sediment abraders), cavitation without tools, freeze/thaw cycles, wetting/drying cycles. Tools: abrasion, plucking is easier with tools, direct impacts to the bed by saltating grains. Materials are generally weaker in tension than in compression so the way to think about impacting grains is that when the particle hits the bed it compresses the bed and then during the elastic rebound it is under tension and fractures. Sometimes get donut shaped fractures. Plucking is often evident in shales and sandstones. Wedging of sand and silt into joints can probably accelerate plucking. At the scale of a single reach, the erosion rate will depend on sediment cover and sediment load. With low sediment cover and low sediment load, not much erosion will occur because the water by itself is not as effective as water with tools. With moderate sediment loads and large exposed areas of the bed, erosion will be effective. But beyond a certain point as the sediment load is increasing, the fact that the river bed is covered by sediment will once again mean that erosion is not very effective. On a larger scale (that of river long profiles) there is potentially a feedback between sediment cover/grain size and slope whereby the river regulates the long profile. Drive back to 395, then a bit farther south on 395 to Pine Creek Road. Take Pine Creek Road west to the gravel pit and debris flow fan. There’s 6000 feet of relief between the valley floor and the peaks. Base level here is more than 3000 feet lower than at Lee Vining. The valley here is a larger scale than Lee Vining. There is a lot of talus along the valley sides. The following picture is looking up the valley. The exposure was bad so I lightened it drastically in Photoshop. RC is Rock Creek. 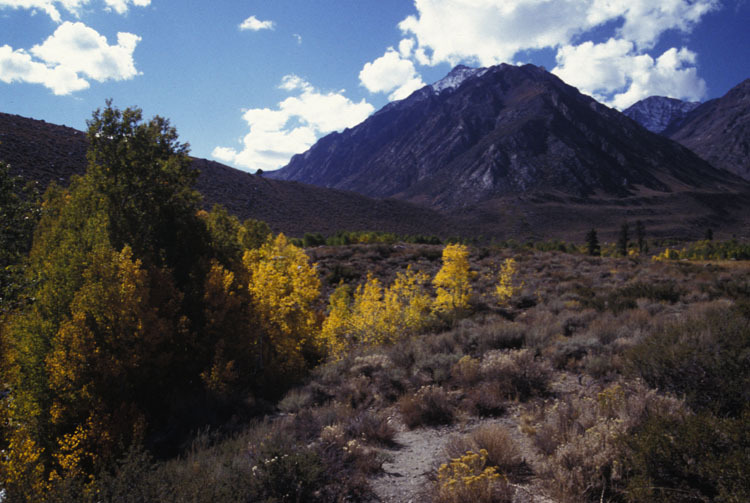 LV is Lee Vining Creek. PC is Pine Creek. Rock fall deposits will tend to be better sorted than debris flow deposits. In the broad view, fine material will collect closer to the apex of the cone and the coarse rocks will roll farther down the slope. Glaciers created the over-steepened walls of this canyon. The creek can’t transport the large grains that are being supplied to it. Close to our lunch stop there were some nice levied debris flow channels. Why do debris flows create levies? As sediment bounces around within the flow, some of it falls out the sides. There is some vertical size sorting in the deposits because the small sediment can filter down between the large grains. The levees also tend to be coarser than the channel. There is a small slot canyon at the head of the debris flow fan. The rock there is probably getting eroded by the debris flows that shoot down it. A general point: small scale structures can cause large geomorphic features. 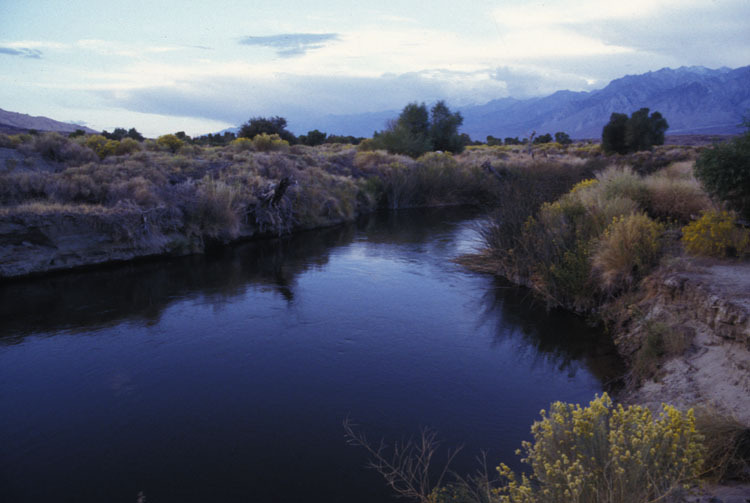 One example would be the fault that creates the Kern River Valley. The most recent debris flow on this fan incised into the fan at the top of the fan and aggraded the fan at the bottom. Drive back down valley to the big tributary slot canyon 37.38368729, -118.6758484. This slot canyon has a much larger drainage area than the one at the head of the last stop’s debris flow fan. 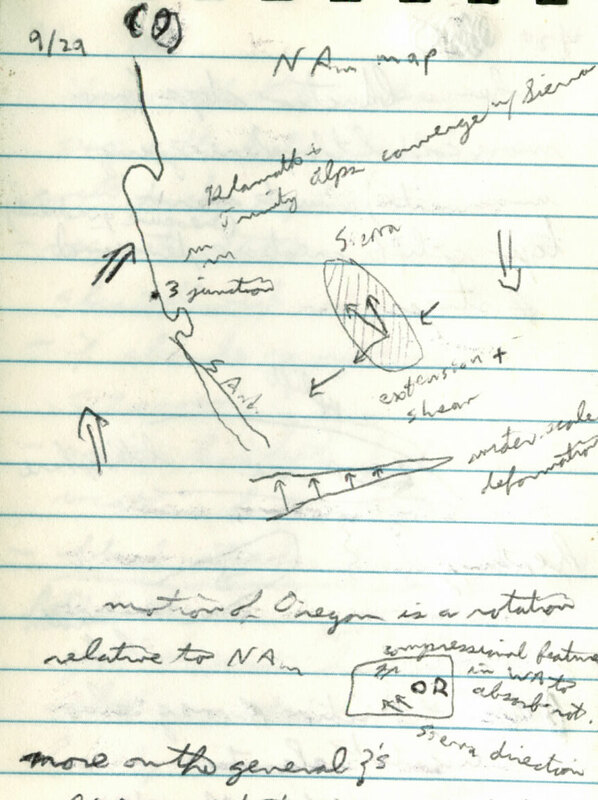 Heterogeneities in the bedrock can start the channels. 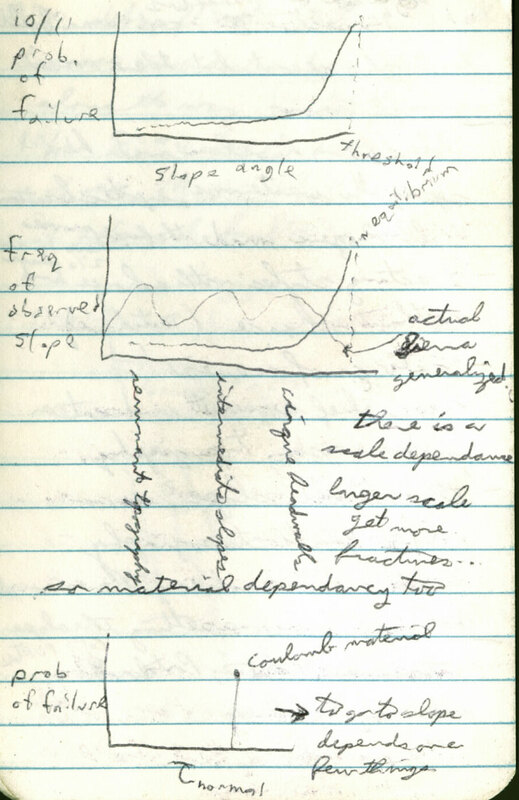 Very few rock bodies are homogenous enough to have a purely erosional control on network development. The slot was carved by debris flows, rock avalanches, and high-flow events in the river (perhaps glacial meltwater pulses). Looking down the main valley to the next tributary canyon on the north side of the valley, we see a number of truncated fans that were deposited when the valley was filled with ice. The fans would have been graded to be level with the ice surface. One of the truncated fans has been incised and a modern fan has built up inside the incision. 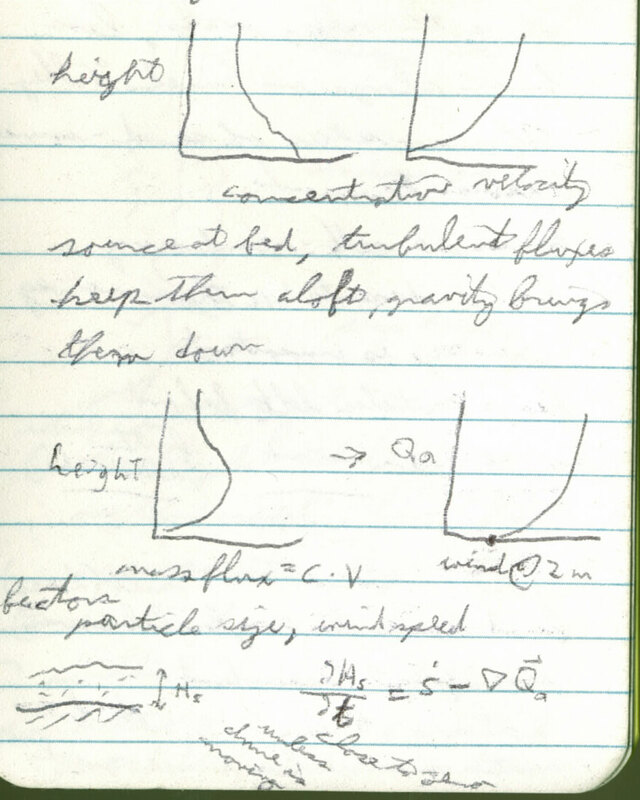 When Kurt was here last (with the undergrad field trip) he did an order of magnitude estimate of the erosion rate in the valley above the fan based on the volume of the fan and assuming that is has been built in the last 15000 years. He found that the erosion rate would have been about .1 mm/year. This is the erosion rate pretty much everywhere in the world except New Zealand (where it is higher) and Australia (where it is lower). The south side of the main valley has a very different character than the north side. The south side is just talus slopes. There are no slot canyons, but there are the beginnings of a few canyons. The reason for this is that the north side of the canyon has bigger drainage areas feeding the channels. The north side has more relief too, the south side is more of a local ridge. Glacial erosion rates vary widely. The world’s fastest erosion rates (measured or inferred) have come from under temperate glaciers, in SE Alaska for example. But erosion rates under the polar ice sheets are some of the lowest measured anywhere. Rivers are in the middle of these extremes. Quaternary erosion rates have been significantly faster than those during previous geologic periods, insofar as we can measure them. Reasons for this may include: the cooler climate produces larger sediment yields, glacial and periglacial erosion processes are more effective than rivers alone, rates of tectonic uplift have been faster. Regarding the efficacy of glacial erosion: There was definitely more erosion under the Laurentide ice sheet than there would have been without it (because of the low slope, rivers can’t do much erosion). But in a place like the Himalaya (steep slopes), it is not clear if glaciers are more effective eroders. Glaciers certainly are more efficient conveyors of sediment, so it is possible that they would expose more bedrock than rivers and hence allow more erosion. Another argument is that the alternation between glacial and interglacial periods produces the fastest erosion. 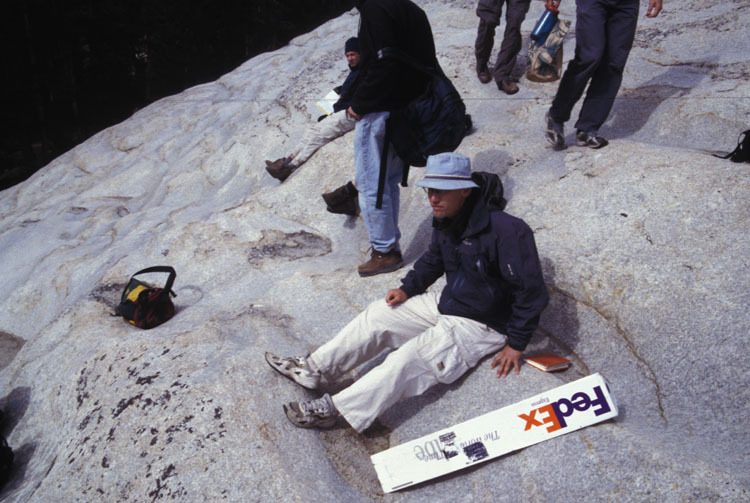 Kurt’s gut says that glacial erosion is faster than river erosion by a factor of pi. Drive back down Pine Creek Canyon to the company town of Rovana. Drive to the south side of town and stop where there’s a good overlook over the landscape to the south 37.41035893, -118.6081956. Looking at the Pine Creek moraine from this vantage point, we tried to decide if it was a constructional complex (multiple glaciations pushed up two ridges) or if it was a single moraine that had been dissected. 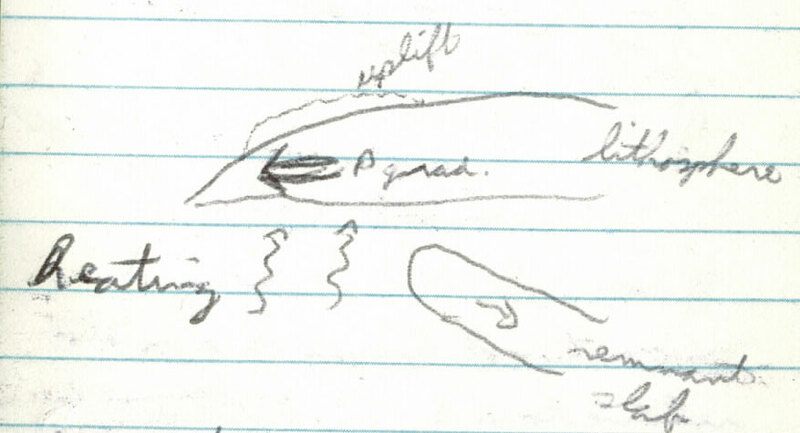 The prevailing opinion was that the outer moraine was built first, the inner moraine built second, and that runoff from the glacier while the inner moraine was being built dissected the outer moraine. 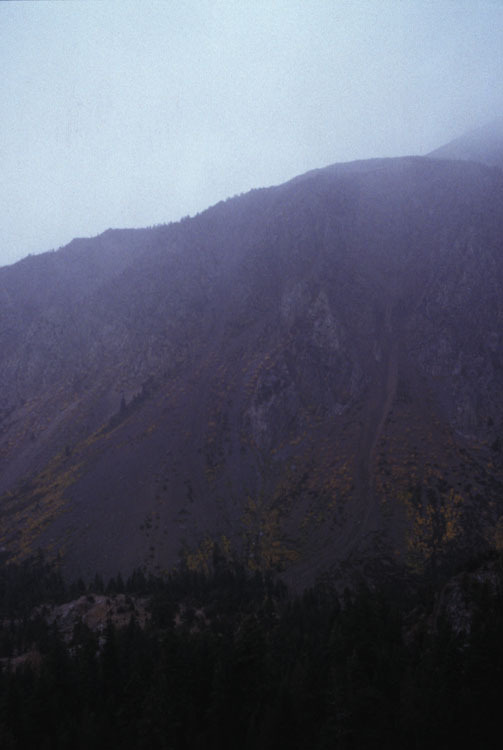 South of the moraine, the debris flow fan is recognized as such by the hummocky surface, lots of little sinuous channels and levee crests, the fairly low gradient (~10%), and by the large grains that it contains. There are some huge boulders out on the fan (the largest is probably about 5 m in diameter). Debris flows can carry big boulders much more easily than rivers. They can easily move material a mile from the source region. 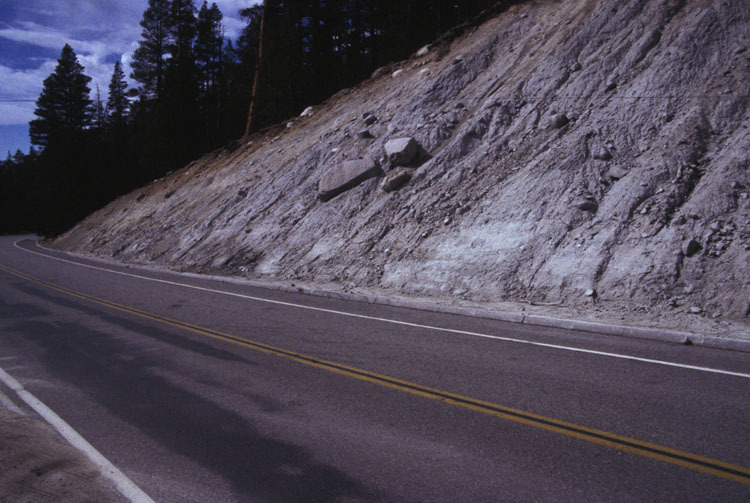 In one case a flow carried rocks more than 6 miles at a 3% grade on pavement near Los Angeles. Debris flows are the dominant transport mechanism at slopes <10%. They tend to have a small source area and pick up material along the way. Distinctions between different mass transport mechanisms: Rock fall is a dry transport mechanism. Debris flows usually consist of roughly comparable amounts of water and sediment. In debris flows the viscous stresses are the most important source of resistance to flow. In a rock avalanche particle to particle stresses are the dominant resistive force. Drive back to 395. 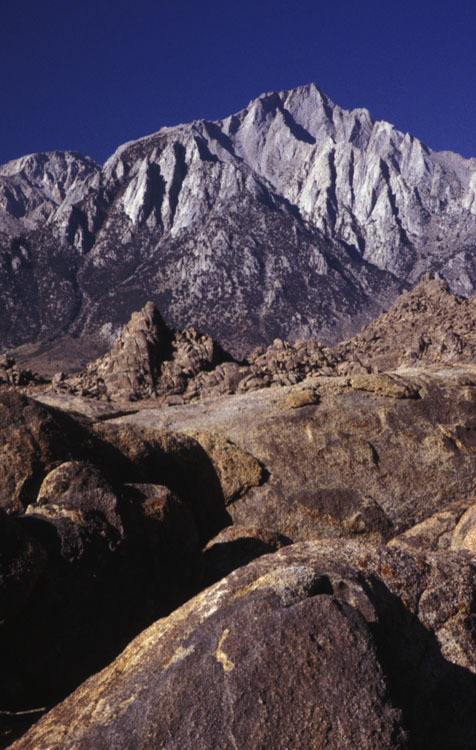 Go south on 395 to Lone Pine and proceed west on Whitney Portal Road, then south on Horseshoe Meadows road, then west again on a small road to camp at the Tuttle Creek campground. Drive back to Whitney Portal Road then cross over to Movie Road and park at Movie Flat 36.60306975, -118.1189456. There are 8000 feet of relief from here to the top of Mt Whitney. 2 normal faults run along the eastern flank of the Sierra here, each of which has about 10,000 feet of vertical displacement. 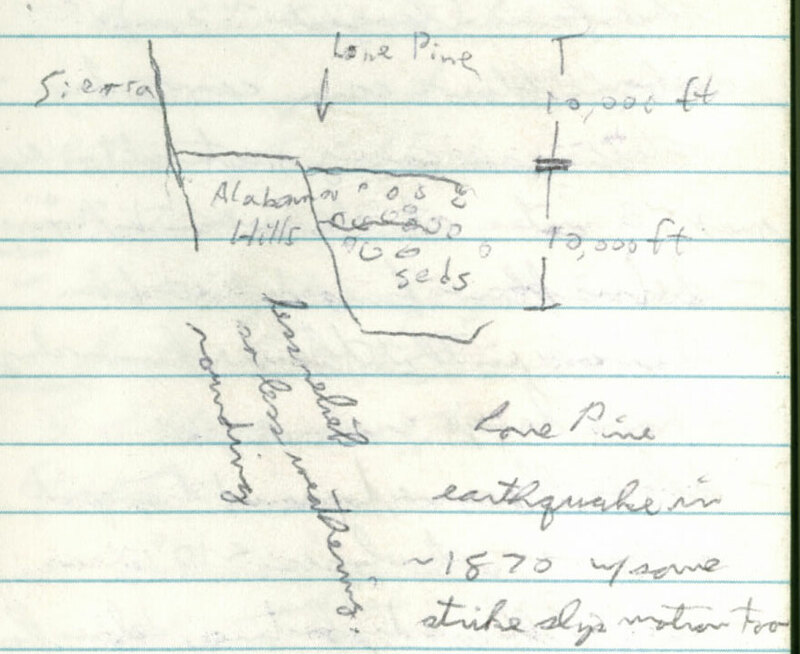 The Lone Pine earthquake in about 1870 occurred on the lower fault. It had a strike-slip component of motion in addition to the larger vertical displacement. 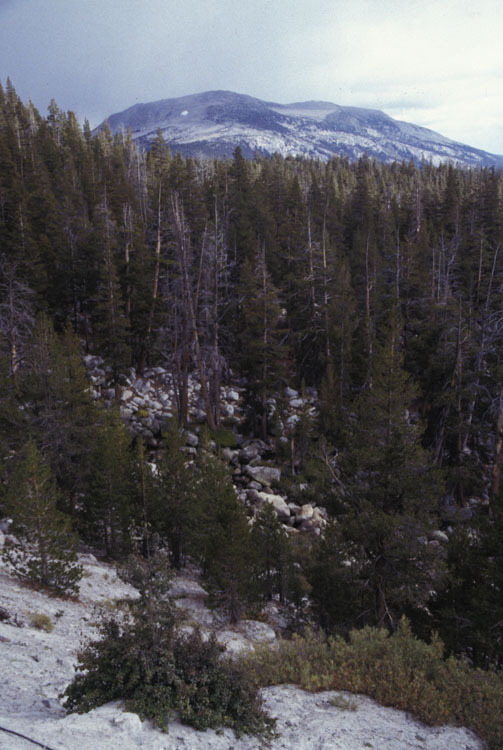 There has been no activity on the Sierra Crest fault for the last 10,000 years. Lots of films have been made here at Movie Flat – especially spaghetti westerns, and it has stood in for many exotic locations. Will Rogers made the first movie here in and went on to make 15 in the space of 2 ½ years. A nice quote comes from Robert Mitchum, an actor who got his start here, he said he had two acting styles: “with a horse, and without a horse.” See the Lone Pine Film History Museum’s website for more details. We reenacted several scenes from Gladiator and G.I. Jane, both of which were filmed (in part) here. The flat summits of some of the mountains here are probably remnants of pre-existing topography. Is there a threshold slope for hillslopes in this area? We see some ribs on the slopes of some of the mountains and whatever is making the channels (i.e. debris flows) is setting the slope of the mountainsides. Drive west on Whitney Portal Road until the first good view of Mt. Whitney. Pull off at the convenient small turnout. PC is Pine Creek. Whitney Creek doesn’t have a low slope close to its base level like many of the other valleys we have been observing. From this distance, there is possibly a moraine on the left side of the valley from this vantage point, on the left side of the tributary valley. The major glaciation and resultant glacial erosion occurred above our elevation here. There are a number of nice cirques here. Some of them have been overdeepened (meaning that the longitudinal profile actually goes up instead of the normal monotonically decreasing elevation). Overdeepening is sometimes associated with confluence areas (where two glaciers come together), but since glacial erosion is thought to depend primarily on the ice flux past a certain point, a glacier with no tributaries could form an overdeepened valley because the ice flux is greatest close to the equilibrium line. Drive a little ways back down Whitney Portal Road to a larger turnout 36.59472473, -118.2151112. 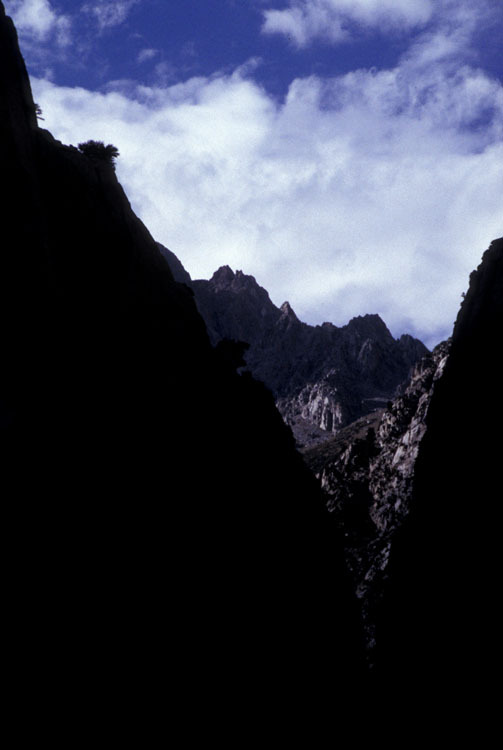 The fan at the mouth of the canyon has a hummocky surface and large grain sizes, indicating that it is a debris flow fan. Another method for distinguishing a debris flow fan from an alluvial fan is to look for channel plugs, where a flow that was following an old channel stopped and deposited a plug in the channel. I didn’t see any here, but we saw some great fresh examples on the second field trip. The fan probably built up during the last glacial period. Now the modern river channel is incising into the fan. The changing climate changed the incision rate of the channel. In the incised channel there are a few “strath” terraces composed of huge boulders. 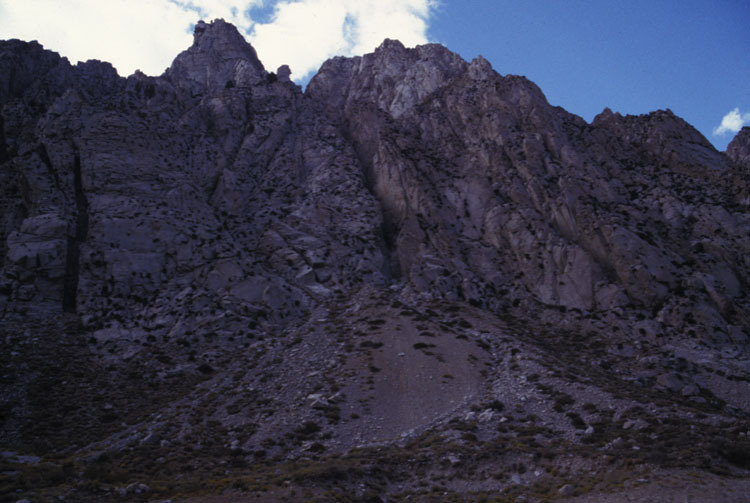 The fans lap up onto the Alabama Hills. 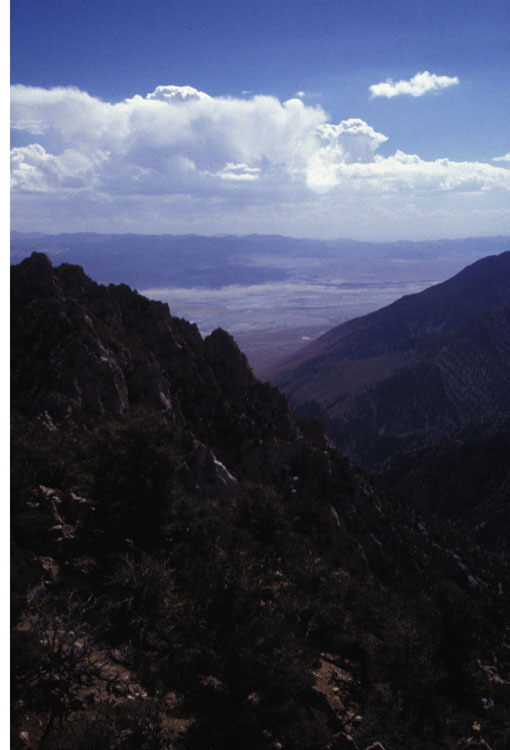 It is conceivable that a sequence of alternating motions on the two faults (see figure above) could expose and then bury the Alabama Hills. Could this fan have been a delta during the Pleistocene high-stands of Owens Lake? We’d have to dig down into the deposit to find out (we’d expect to see some layering, foreset bedding planes, etc.) but the surface deposits are definitely debris flow deposits. The narrow valley floor here indicates river erosion, rather than glacial. The hanging tributary valley on the other side of the main valley could have been glacially eroded or it simply could be a nick point propagating upstream. 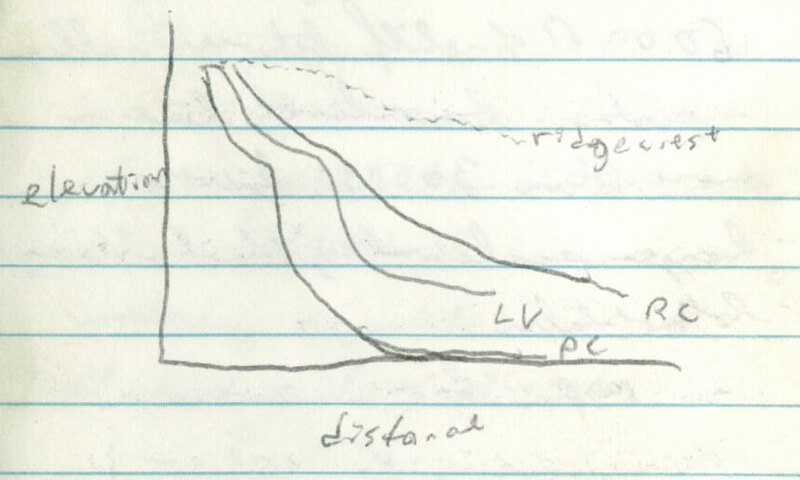 The nick point might propagate into the tributary valley more slowly than into the main valley because of the larger erosive capacity of the main stream. Rock falls and debris flows are the main mechanisms transporting material to the trunk stream here, though creep has a role too. 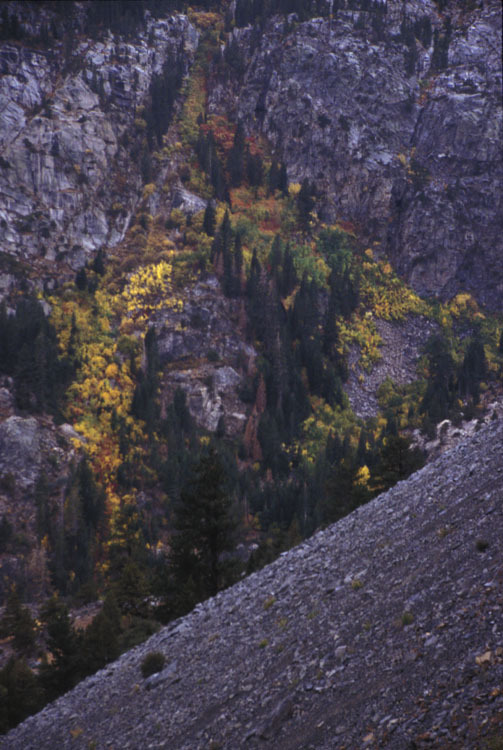 The trees on the slopes add cohesion to the soil to reduce the chance of slope failure. The trunks may also act as roughness elements to slow down a small debris flow that was transporting material over the slope without knocking the trees over. It seems quite common to see transport-limited and production-limited patches in the region, and particularly in this valley. This is probably due to the fact that in the semiarid climate since the last glaciation, neither production nor transport has been very strong. The vegetation is probably limited by the amount of water rather than the amount of regolith. The steep slopes mean that even without much water, transport down the slopes can still be effective. There needs to be some sort of negative feedback to maintain this type of landscape (mixed production- and transport-limited hillslopes). Who knows what this feedback is? The stream channel is probably full of boulders and perhaps some areas of exposed bedrock. The bed probably gets eroded during large floods. Continue driving up Horseshoe Meadows Road to the top. Park at a sizeable turnout (trailhead?) 36.46671555, -118.1329094.The upper Cottonwood Creek basin is now visible. It is much broader and flatter than any of the other valleys we’ve been in so far. 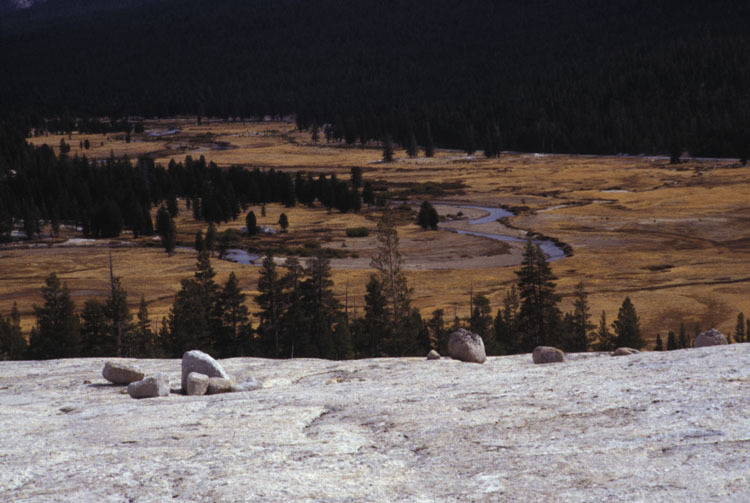 A ring of cirque basins surround Horseshoe Meadow. This is the edge of the Kern Plateau. The peaks just south of here are the last of the High Sierra. CC is Cottonwood Creek. WP is Whitney Creek. PC is Pine Creek. An erosional wave that is propagating into the mountain front is evident in the long profile. The extent of glaciation plays a role in controlling the long profile. 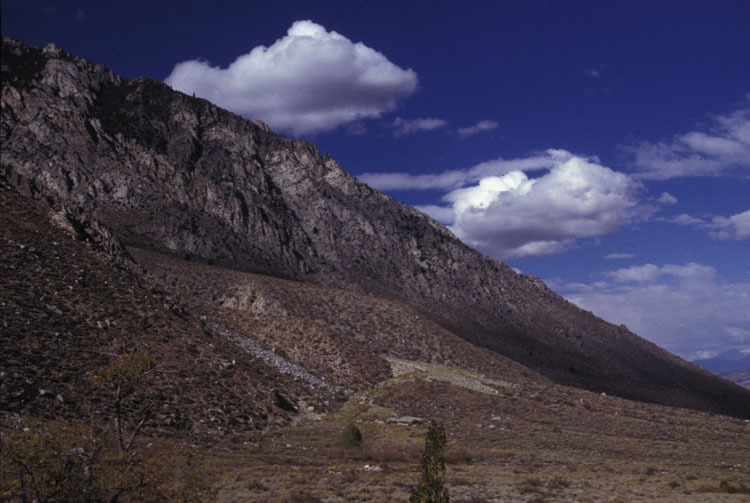 Cottonwood Canyon was less extensively glaciated compared to the canyons farther north. General points: 1) there is a general climatological gradient in precipitation between Los Angeles (low precip) and Seattle (high precip) that is caused by the path of cyclonic storms that come from the North Pacific. 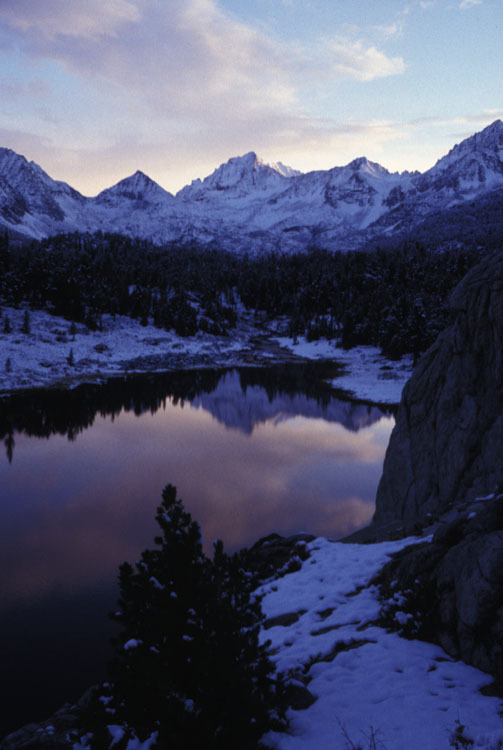 2) The high part of the Sierra range is broader in the south. It is split into the Great Western Divide and the Eastern Divide, so the eastern front of the Sierra will experience a larger rain shadow effect in the southern Sierra than in the northern Sierra. The western range down here experienced a more extensive glaciation than the eastern range. 3) The relief is greater in the south than the north. There has been about 20,000 feet of displacement on the normal faults near here but only about 5,000 feet of displacement up near Mono Lake. The stream in the Horseshoe Meadow basin is a fairly steep boulder-bedded stream. There is probably not as much bedrock erosion here as lower down due to the lower slopes here. From afar there is no evidence of high flows, indicating that they’re probably not too important for the morphology of the river. The peaks in the distance are being eroded in a periglacial environment. Note to self: Reference: Terrestrial Vegetation of CA. Temp and precip vs altitude. Drive back down Horseshoe Meadows road, back to 395, and south on 395 to 190. Take 190 northeast for a few miles until a dirt road leads off toward the Owens Valley sand dunes 36.28875014, -117.9769696. We saw active transport on a day when the winds were fairly strong. The Great Sand Dunes of Colorado were built where the prevailing westerlies lift off from the surface to go up and over the Rockies. The source of sand here is the bed of the historical Owens Lake and the fans along the valley walls. The source for much of the sand in the African seas of sand is the Arabian Peninsula. 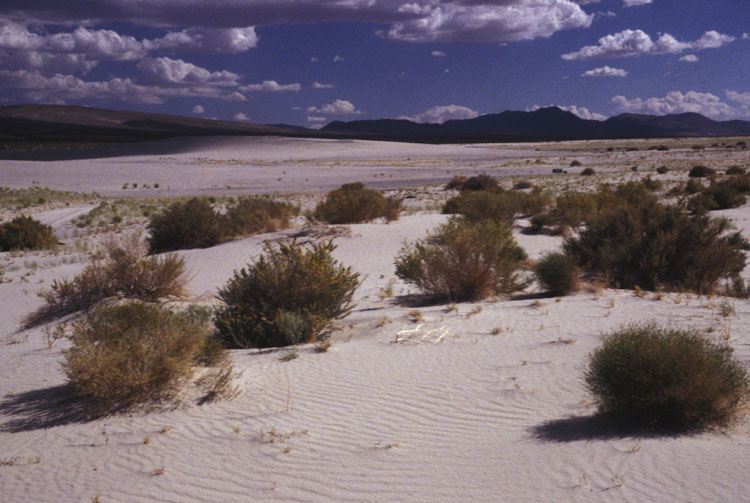 Dunes form best in deserts because there’s no vegetation to reduce sand transport. The size of the sand grains is important for the form of the dunes. Large particles get left behind in slow winds. 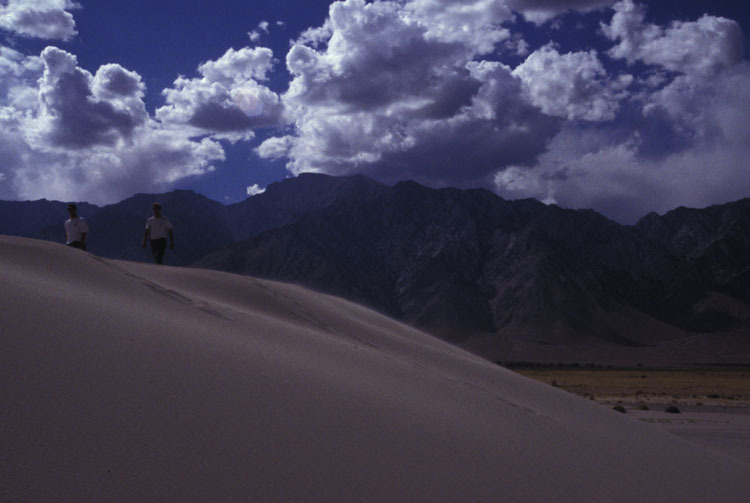 Dunes occur in proglacial environments too, i.e. East Greenland. The winds on Mars are often about 100 mph, but since the atmosphere is much less dense, a given wind speed is less effective at transporting sediment than it would be here on Earth. Gravity is weaker on Mars though so some huge dunes have formed. Some are a couple km tall. More have formed in recent years than earlier times. What controls the type of dune? 1) Supply of sand (average thickness on landscape). Low supply will yield barchan or crescentic dunes. High supply will give star or linear or sinuous dunes. 2) Directional constancy of the wind. There are multiple scales of bedforms visible on this dune. The moisture in the dune is important for the establishment of vegetation. Drive north on 395. Take a small road east from 395 and then go south on a dirt road. Stop at the Owens River 37.04915556, -118.2211794. The Owens River here is still north of the complete diversion to the LA aqueduct. There is a nice recirculating eddy alongside the bank here. The channel is most definitely of the meandering type here. There is a big bend with a cut bank and a point bar. The vegetation here does not add much bank stability due to the vegetation’s sparseness. Meandering rivers need to maintain enough discharge and slope to allow a feedback between instability in the banks and water momentum. Drive north on 395, go 8.5 miles past Bishop and then turn off onto South Round Valley Road and go 5 miles to the Horton Creek Road. Camp at Horton Creek Campground. Drive back to 395, go south to 168. Take 168 east for a couple miles and then turn right onto Death Valley Road. Stop when a good view of the badlands is possible 37.17187006, -118.1960935. The strata here are lake sediments from Owens Lake that have been uplifted relative to the valley floor. 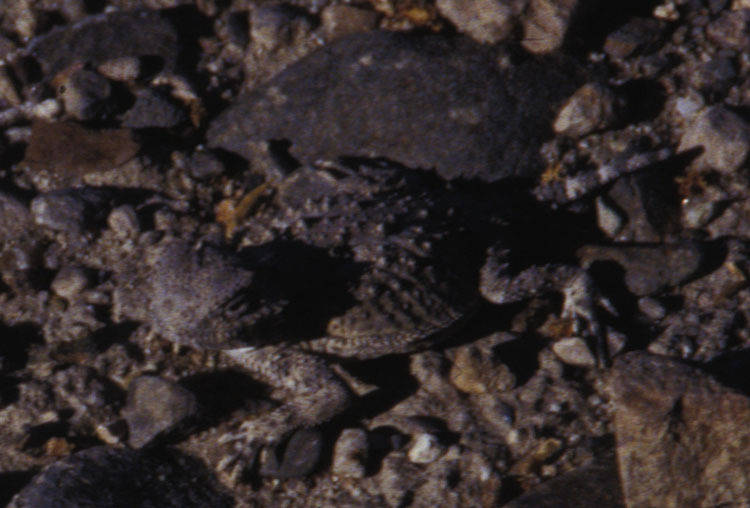 To form badlands, a material that can be eroded with low flows is needed. Generally, badlands occur in semiarid to arid regions, because otherwise vegetation would take over. There are lots of small-scale channels. Overland flow is the dominant runoff generation mechanism. The sediment has a low infiltration capacity. Bursts of rain are more effective at eroding a landscape like this than drizzle because hard rain produces erosion by rain splash. South Dakota and North Dakota also have badlands. In South Dakota, the Missouri has incised over the Quaternary, the White River has responded to lower the local base level for the Badlands and the Badlands themselves are the result of the erosional wave propagating into the landscape. What sets the spacing of the rills? A competition between overland flow (which tends to channelize the water) and rain splash (which tends to smooth out the rills). Some people argue that in general more episodic precipitation causes more incision because vegetation has a more difficult time getting established. The time between flows allows weathering to occur so the material is easier to remove when the next big flow comes along. 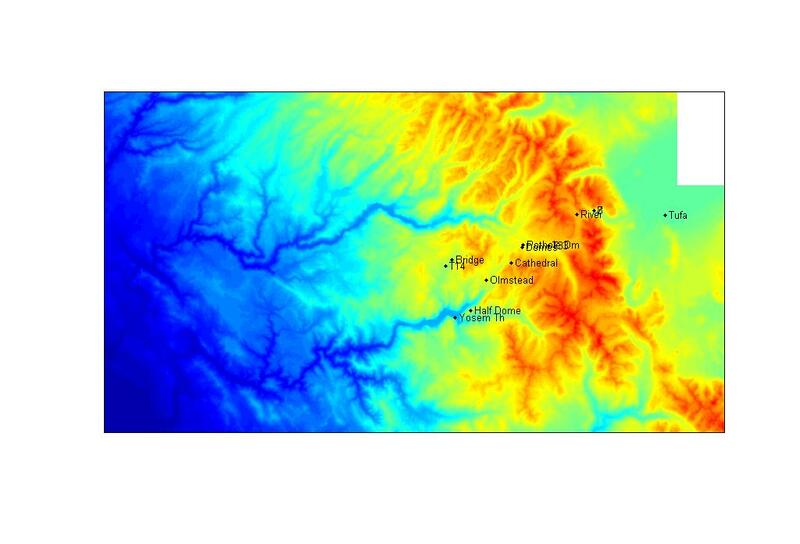 Variables that are not yet accounted for in the time dependant river erosion equations are the variability in precipitation and sediment supply. Vegetation is also not included and there are some potentially important feedbacks between the vegetation and the landscape. Evapotranspiration is often more important than evaporation. In scrub vegetation ET is about twice as high as the precipitation in some places where it has been measured (the plants are getting extra moisture from the ground). Current landscape evolution models don’t include dynamic, realistic vegetation. Mudcracks are created after tensional forces are set up by the drying (and contraction) of the mud. Since the tension is basically isotropic the cracks form polygons (instead of some more elongated shape). Why don’t we have patterned ground everywhere like in periglacial environments? The periglacial environment is distinct because the ground is frozen and hence very cohesive. In other places creep processes are active enough to smooth out any patterning. What sets the size of the cracks? The amount of contraction, the amount of stress for a given contraction, the speed of contraction relative to the speed of creep or other diffusional processes. Lava flows also give polygonal shapes when they contract. Drive a few more miles east on Death Valley Road. Stop just before the Saline Valley turnoff 37.12819456, -118.0593268. There is a nice desert pavement here. How does the pavement form? As the granular mass of loose sediment is agitated by the wind (or ice in the case of periglacial environments) the smaller particles filter down into the spaces between the larger particles, leaving the big ones on top. Strong winds may also remove some of the smaller particles until just a surface layer of larger particles that is immobile relative to common wind speeds is left. The pavement here has been stable for a long time. Lots of lichens are growing on the sides and tops of the pebbles. This area is more typical of the basin and range type landscape than the other stops on this trip. 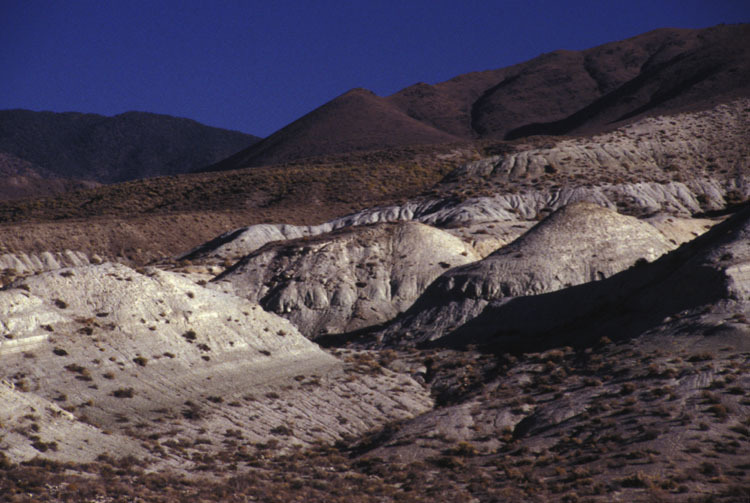 In landscapes like this, calcrete layers can form under the surface after precipitation evaporates. Shallow subsurface flow and sheetwash are the dominant runoff generation mechanisms here. There are few channels because of the vegetation. The drainage density here is medium (some forested areas have very low drainage densities, badlands have very high drainage densities). 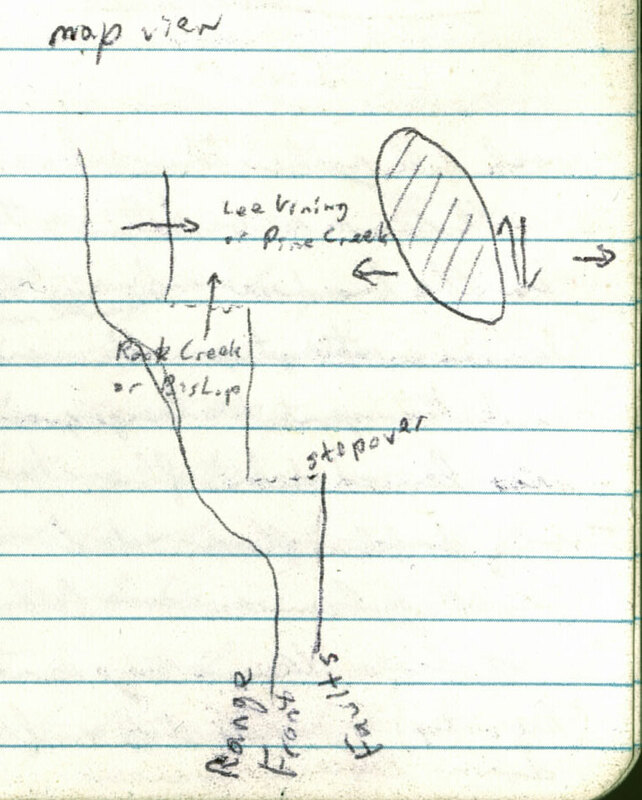 Downslope transport of sediment here is by creep: viscous flow and expansion then contraction of the regolith where the expansion happens perpendicular to the slope and the contraction happens vertically because gravity is the restoring force. The base of Eureka Valley is about 2000 feet lower than here so the shrubs are less abundant. It is a production-limited environment. Drive back to 395, go north to Bishop and then take 6 out of town. Stop at a convenient turnout for a view of the White Mountains 37.58348269, -118.3841655. 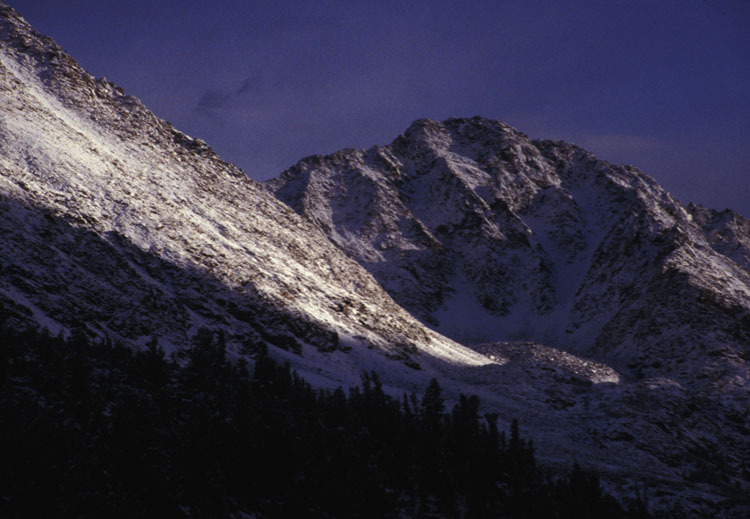 The morphology of the White Mountains is very different from that of the Sierra despite having similar relief and local ridge to base level distances. The valleys of the White Mountains are very V-shaped. The upper reaches of the valleys are much smoother. There are no sharp peaks. The fans have smaller grain sizes than the Sierran ones. Why do we see these differences? Lithology (weaker rocks here), climate (drier, not enough snow for glaciers to have formed). Turning to look at the Sierra from a distance, we see a strong accordance of summits (that is, all the summits are about the same height). This has been observed in nearly all mountain ranges, except for areas with active mountain building by volcanoes. There are a few possible reasons for this: the legacy of pre-uplift topography (which would tend to be planar), uniform uplift across the mountain range, uniform drainage density, constancy of processes of glacial (the glacial buzz saw effect) and fluvial erosion. These various possibilities would have different strengths in different mountain ranges. 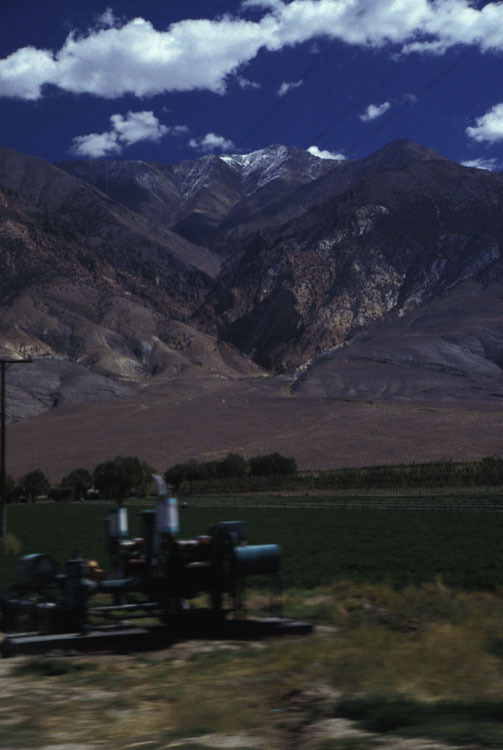 The Owens Valley down-dropped block is tilted – there is more relief in the south. 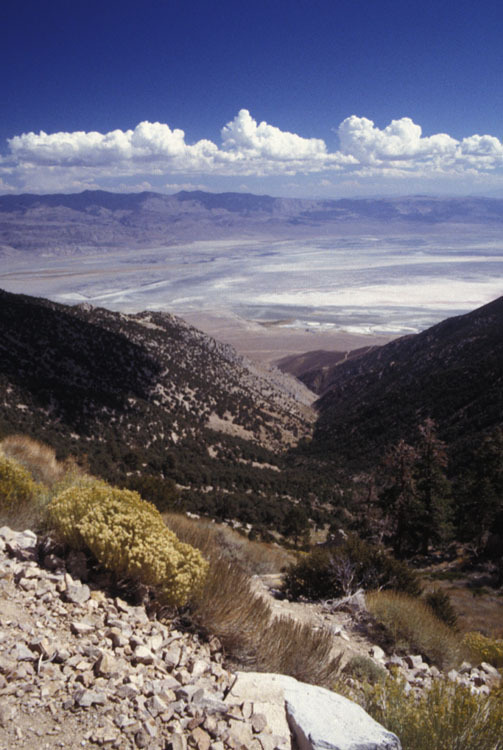 The reason for this is that the maximum extension of the Basin and Range topography has happened at the latitude of Death Valley (and the southern end of Owens Valley). The total lengthening since the cessation of subduction is thought to be a factor of 2. Continue north on 6 to the junction with 120. Take 120 west to the Mono Lake Tufas 37.94160185, -119.0290552. With the climate change since the last glacial, the lake level has dropped. There’s now a higher evaporation rate from Mono Lake. Runoff entering the lake is different too, as is the vegetation types on the hillslopes. It turns out that most of the change in lake level can be explained with a change in evapotranspiration. The Pleistocene shorelines can be seen on the opposite side of the lake from here. During the Pleistocene, Mono Lake may have overtopped its spillway. Currently the lake is in a closed basin. This means that solutes tend to concentrate in the lake (the lake level has gone down and the inputs to the lake have high solute levels relative to the water vapor that’s lost by evaporation). As the evaporation happens, an imbalance in the number of anions and cations develops. It is thought that excess calcium ions build up in the lake. Then in places where freshwater springs supply the limited ions (in this case bicarbonate) precipitates form. 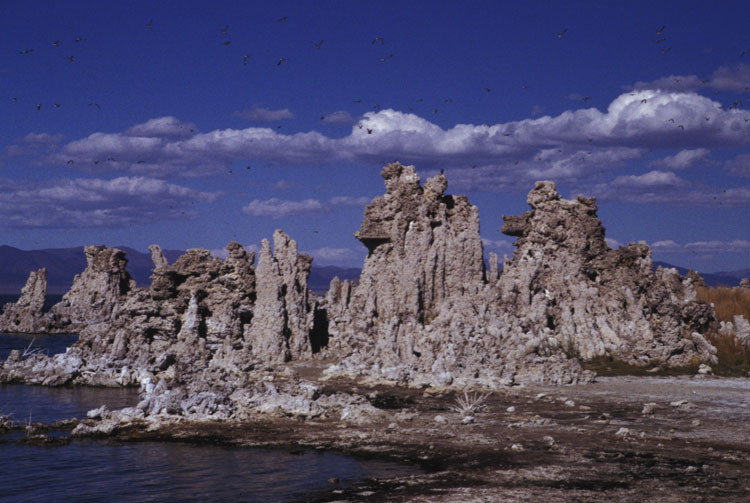 In Mono Lake these precipitates take the form of pillars of limestone called tufas. 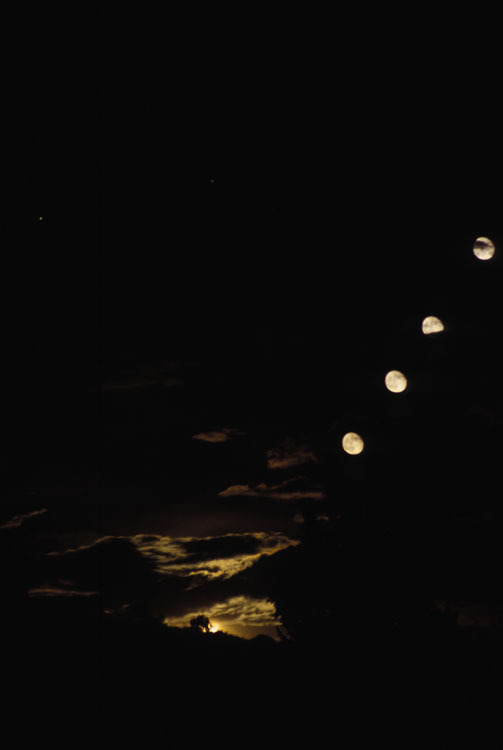 Similar forms have been observed to form in rivers too. 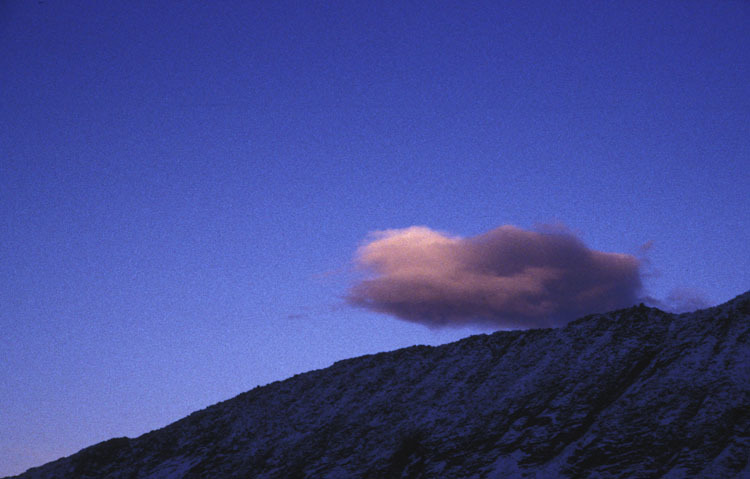 Why do cumulus clouds form over the mountains? 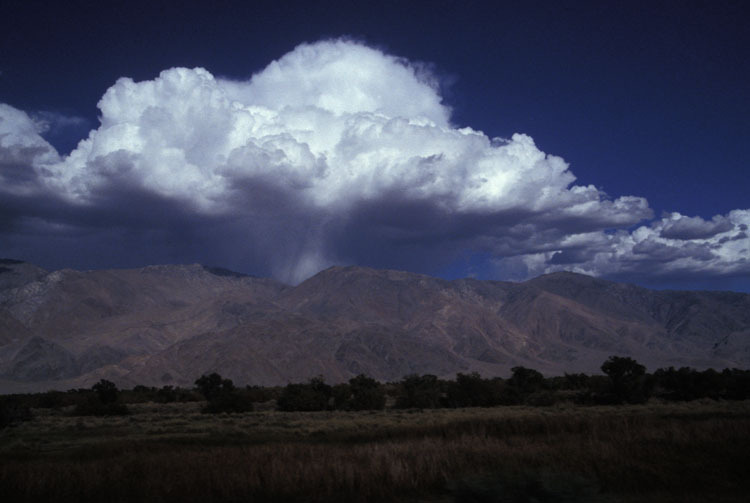 An air mass needs to be cooled in order to get condensation and clouds. There are a few ways to do the cooling: 1) air can be deflected upward by mountains. This upward motion makes the air cool and water vapor starts to condense. Condensation releases latent heat, which then drives more uplift and the feedback can continue. 2) The ground surface temperature goes up at the mountain tops. The ground temperature increase heats the air above it which then generates lifting of the air and the condensation/uplift feedback takes over. This localized effect is why we see cumulous clouds instead of a broader cloud type in light of the broader mechanism in 1. 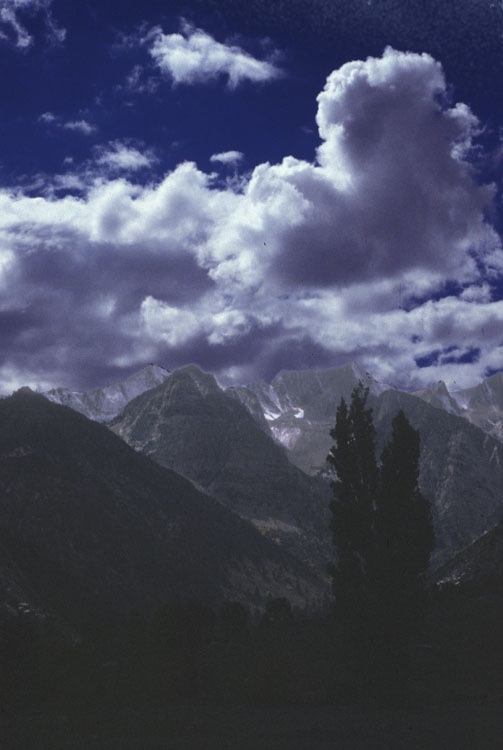 A negative feedback controls the steady-state behavior of the clouds: more clouds means that the mountaintops are being shaded and hence get less surface heating (by solar radiation) and hence less uplift of air and less clouds. Drive north on 395 to 108. Take 108 west towards Sonora Pass. Stop at the turnout just after the second sharp switchback overlooking Leavitt Meadow 38.32741474, -119.5549626. There are 1000’s of feet of volcanic deposits above the granite pluton that postdate the pluton. The contact between the volcanic and granitic rocks can be seen from here. The patterns of vegetation on the slopes show upward propagation of rockfalls and debris flows. This area was glaciated. There are lots of lakes in the upper basins, we passed some moraines driving through the bottom of the valley, and we can see some large erratics and other morainic material on the near hill/ridge opposite us. There’s a nice broad valley here with a wide floodplain. This depositional basin was created because the glaciers overdeepened the valley. The channel of Walker River is meandering. There are active point bars, cut banks, other bars, remnant channels, and in some places wide gravel plains on the sides of the channel. Tower Peak, visible in the distance due south of here, is the source of Walker River, and despite the looks of it, there is actually a continuous slope from there to the river below us (it looks as though there might be another drainage between here and there). The lack of vegetation along the banks can be explained by high flows which are frequent and powerful enough to wash out the vegetation. Drive west on 108 a short distance to Leavitt Waterfall 38.31950, -119.56181. 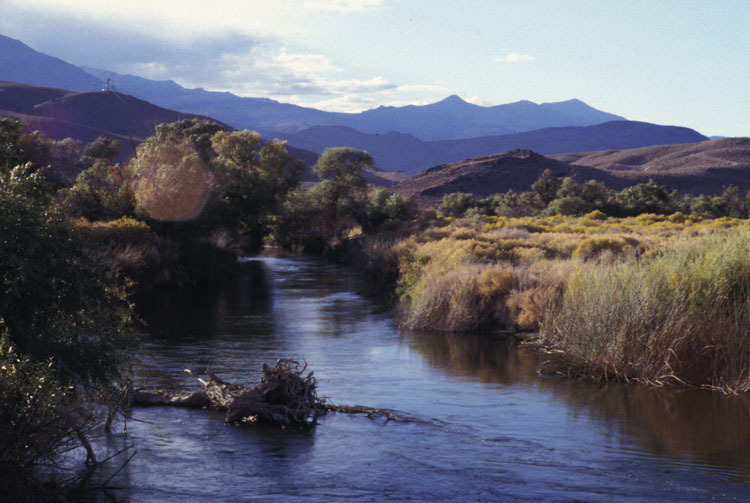 Leavitt Creek is a tributary to Walker River. The stream is eroding into a slot canyon. Playfair’s Law states that tributary rivers join their trunks at the local base level. But something different is clearly going on here. Glaciers don’t obey Playfair’s Law because erosion isn’t directly proportional to the bed slope. Instead it is proportional to the ice flux / thickness of the glacier. This is why hanging valleys are often a good indicator of glacially eroded landscapes. In glaciers with a lot of meltwater, there’s a lot of discharge in the subglacial streams and the potential for erosion is large. Rivers exiting from subglacial tunnels have been observed transporting large boulders. Continue driving west on 108. Go over Sonora Pass, stop when the contact between the volcanic and granitic rocks comes into view, roughly a mile beyond the pass 38.31700676, -119.6665154. The slopes with volcanic bedrock have a lot more gullies because the volcanic rocks have more layers and greater lithologic inhomogeneities. The runoff from the volcanics is affected by greater infiltration rates. There are a few springs in the volcanic rocks but we don’t see any in the granitic rocks here (or elsewhere). 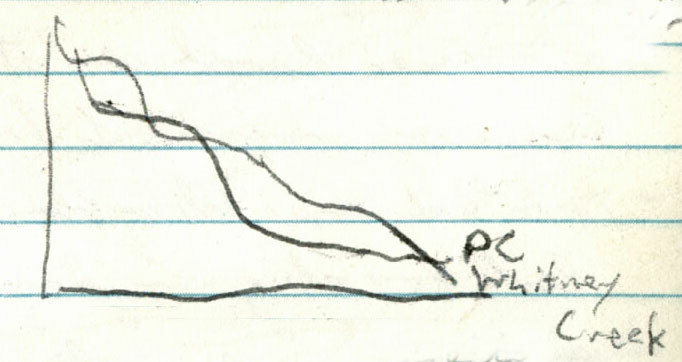 Downslope transport happens by rockfall. The talus cones produced exhibit size sorting. There are some debris flow channels as well. Some of the channels have diffused out but a few fresh ones are visible too. A bedrock channel/slot seems to be the source of the flows. Are rocks avalanching down the gullies and then starting the flows, or is there a firehose effect where water is rushing down the gullies? Unless the talus slope was already saturated, a water flow like this might just filter down into the talus without causing any debris flows, so the runoff history may be as important as the size of individual runoff events. 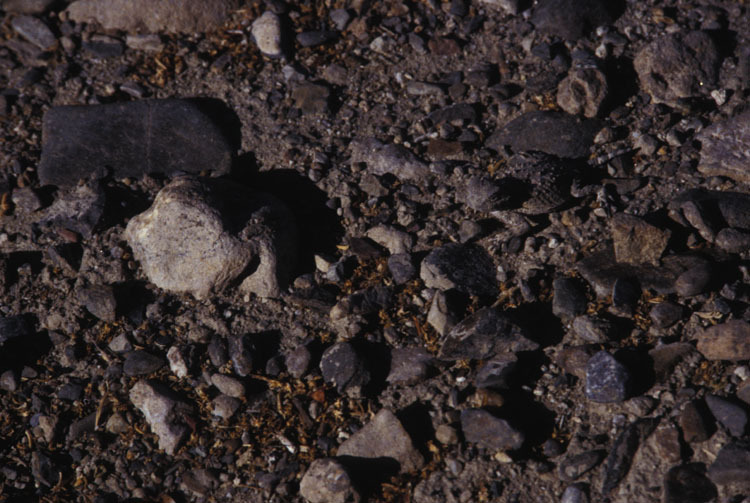 In many cases, fine sediment fills in the talus cones such that there is just a surface layer of coarse rocks with air-filled voids. The river channel in the valley bottom is of the cascade form here, but it appears to be starting to form a step-pool channel. There would be 2 phases of transport in a river like the one in front of us. One phase would be a small stage flood, recurring every few years, that moves some of the rocks without rearranging the plan form of the river. Then there would be the larger phase where big boulders move and the bars are rearranged. Drive further down the road to a turnout with a view of some avalanche scars 38.32493847, -119.7077268. 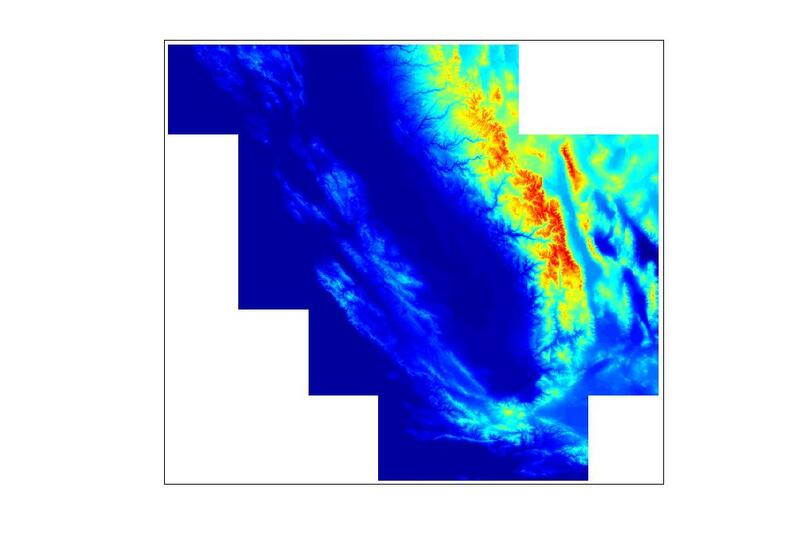 Can snow avalanches do geomorphic work? They certainly rearrange trees but we don’t see much denudation or sediment deposition related to this scar. The trees are larger tools than are normally transported over the slope, so they may be able to dislodge boulders that wouldn’t be dislodged otherwise (but we don’t see that here). There is probably a coverage issue – the avalanche moves over a layer of snow and hence doesn’t have access to the regolith to do much erosion. Have the trees moved downslope (in the avalanche) or just toppled in place? It is hard to tell from here. Whether they snapped off at the base or actually pulled up the root wad would also be important for the geomorphology. Continue down 108 to an overlook of the Emigrant Wilderness 38.31491774, -119.7434881. 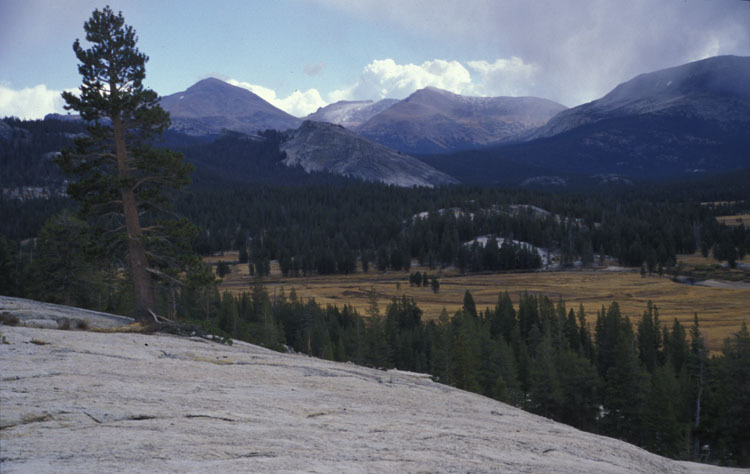 An extensive region of glacially eroded granite is visible from this overlook. There has been time since the glaciation for the vegetation to take hold. The valley cross section is somewhat U-shaped. The glaciation here was not as extensive as farther south. The basins in this region tend to be smaller than those to the south (i.e. Yosemite) so the main trunk glaciers here did not make it down to elevations as low as those in Yosemite. The valley below us may have been occupied by ice only during the glacial maxima. There are some bedrock features high on the walls which probably weren’t heavily affected by the glaciers (we can see spheroidal weathering). A few miles farther down the road, stop at a campground with a gorge on Deadman Creek 38.34028884, -119.7957936. Above this gorge there are alluvial and bedrock sections of the channel that are a consequence of the sediment load left over from the glaciers. This gorge’s incision may have started subglacially. It is also possible that it is a more traditional river nickpoint. Regardless, it seems that the erosional wave is becoming more diffuse. The sides of the gorge are nicely scalloped. There are flood deposits about 2.5 m above the current river level just upstream of the gorge. During floods, the drag on the walls of the gorge may build up to the point that the river overtops the gorge (a hydraulic dam). A few gorges in Switzerland are 100 m deep, so this one is a baby by comparison. Drive back to Berkeley (go west on 108 to 120 to 5 to 205 to 580 to 13 and then the city streets) and pronounce the field trip a success!